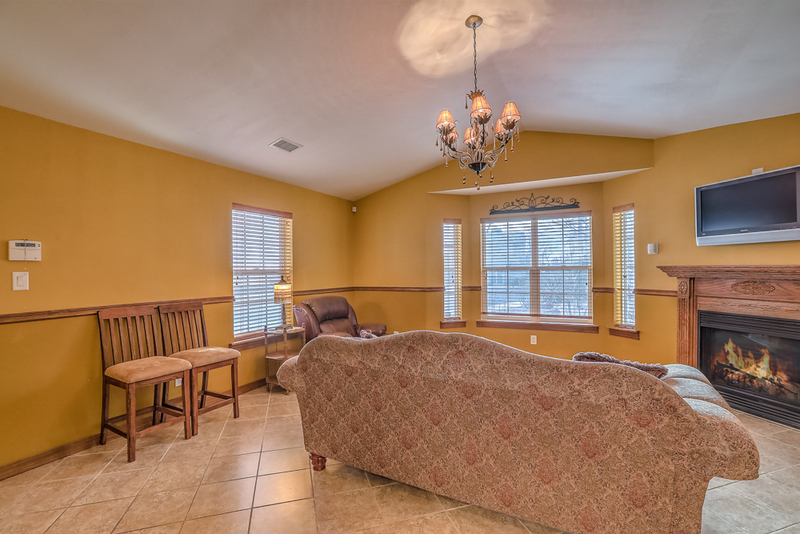 We have an all new website to showcase our New innovative services and packages. 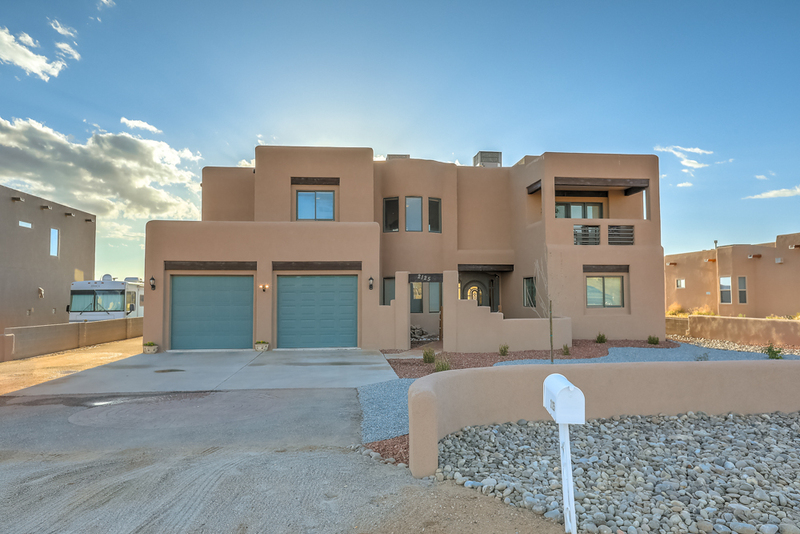 Welcome Home to this beautiful custom, single story home! 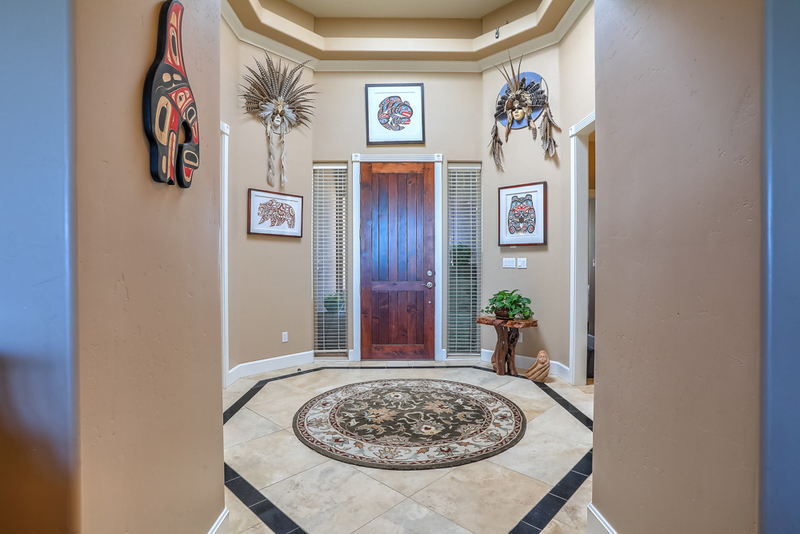 Inlayed, decorative Travertine flooring greets you. 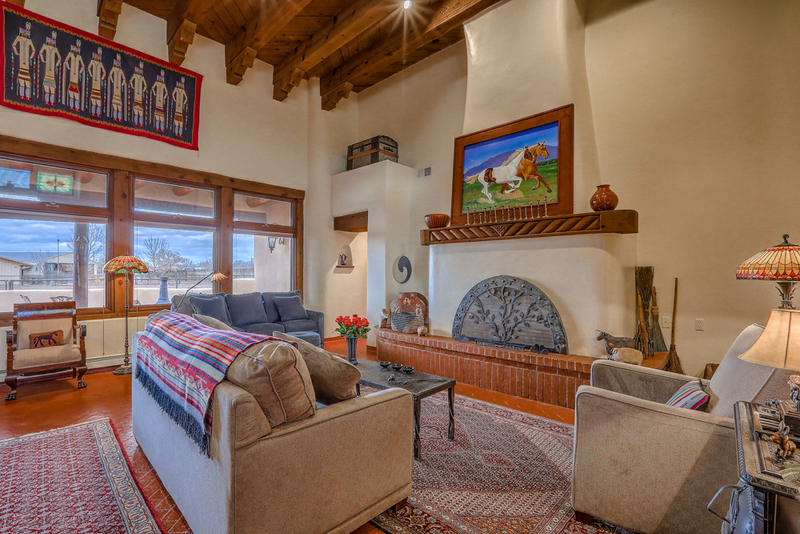 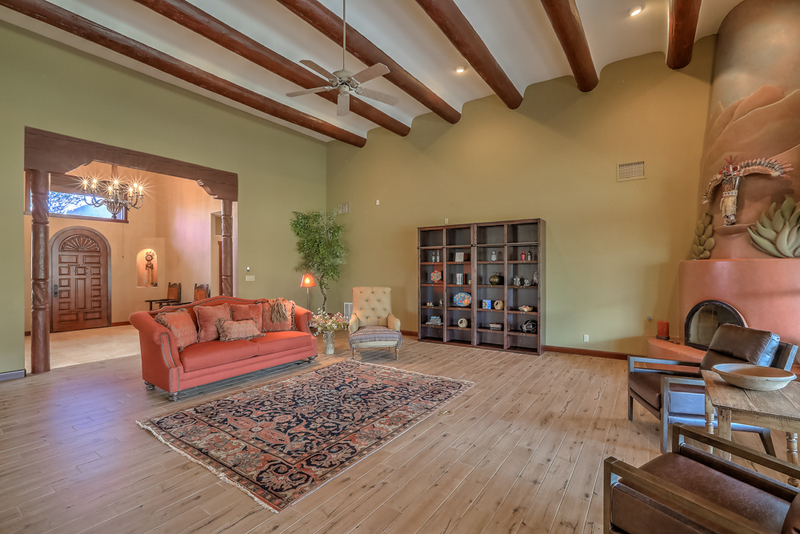 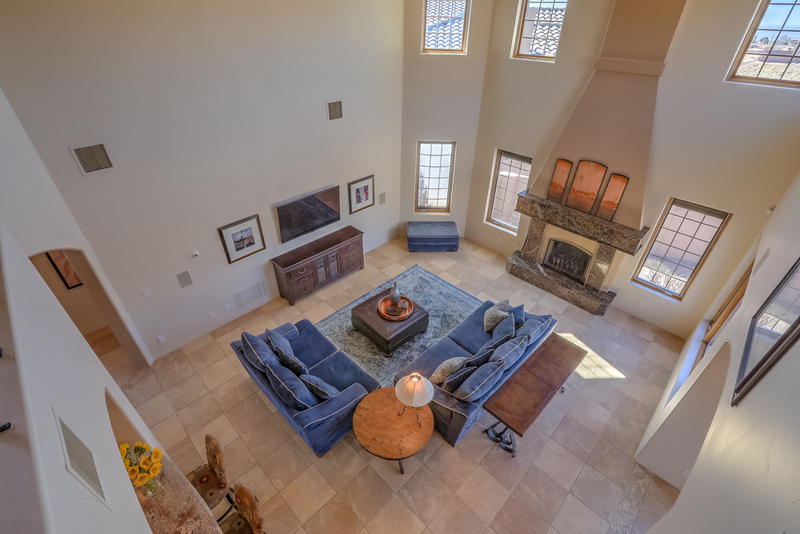 The large living space features hardwood floors, a stacked stone fireplace and natural light. 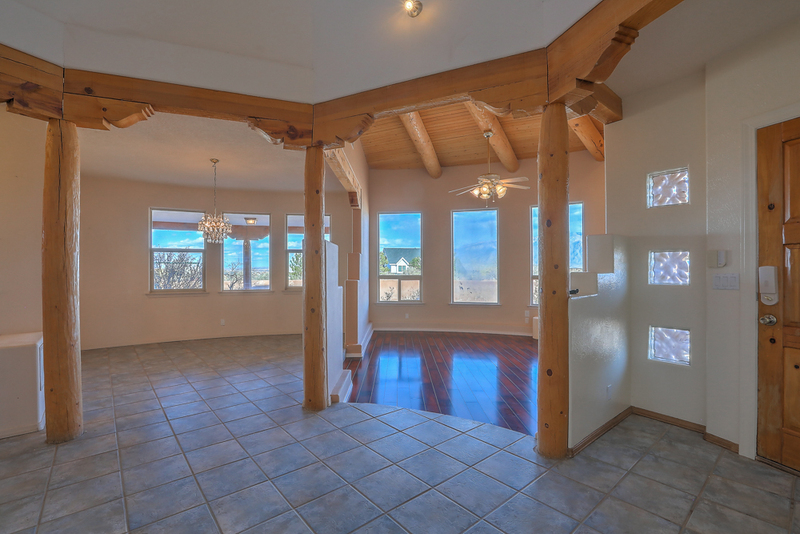 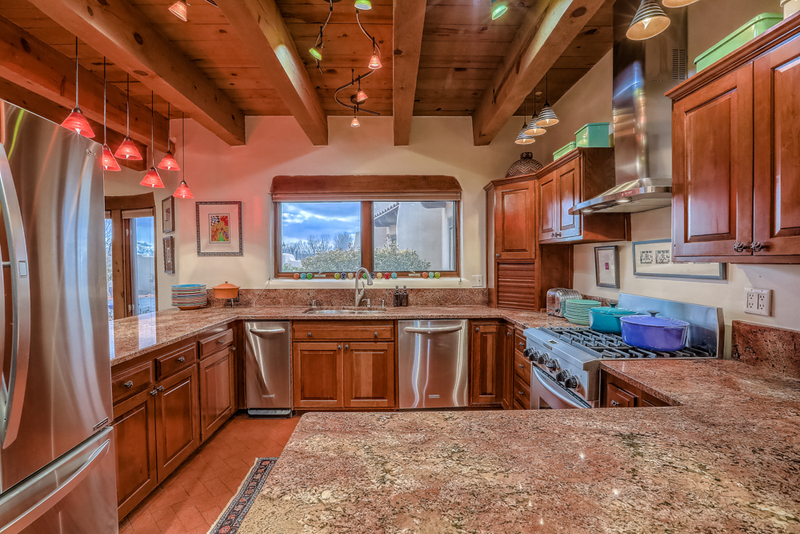 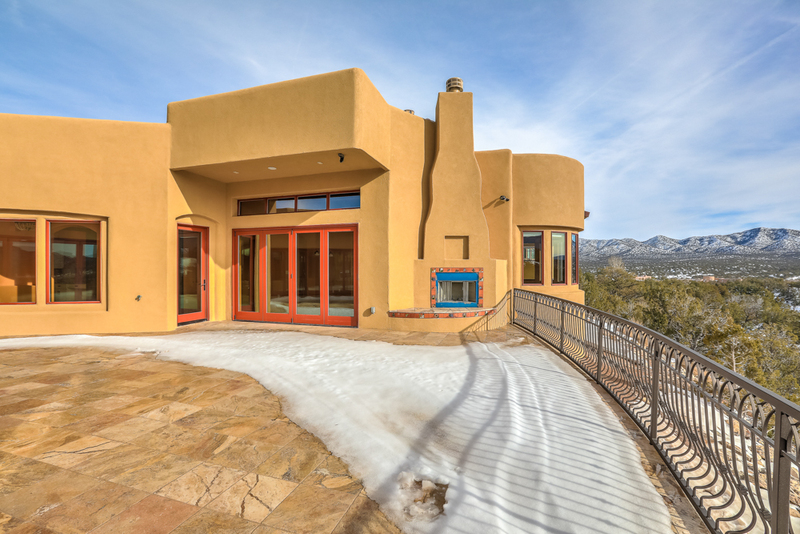 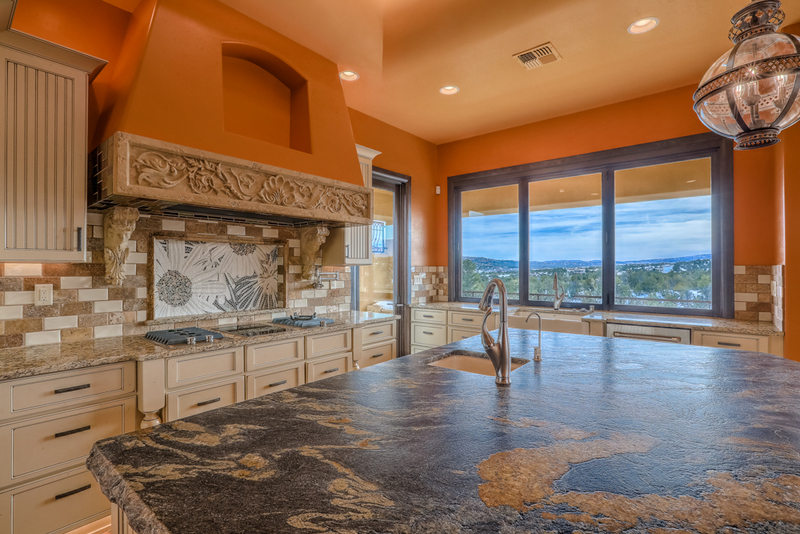 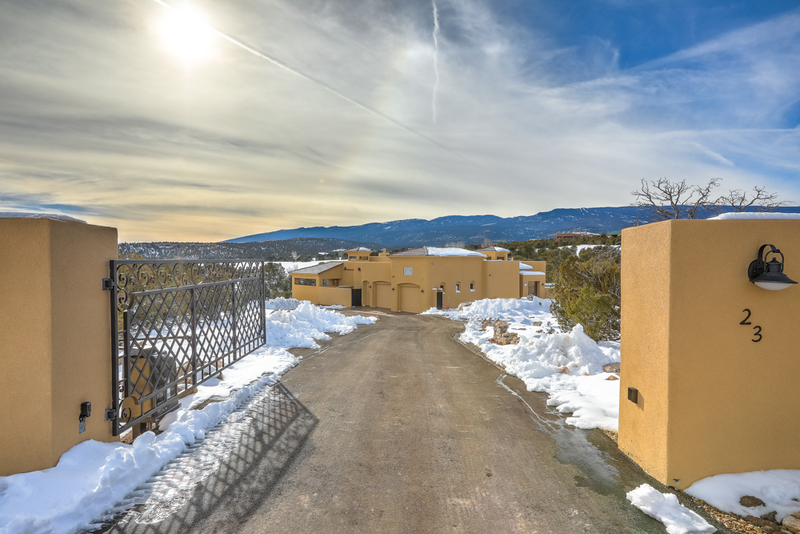 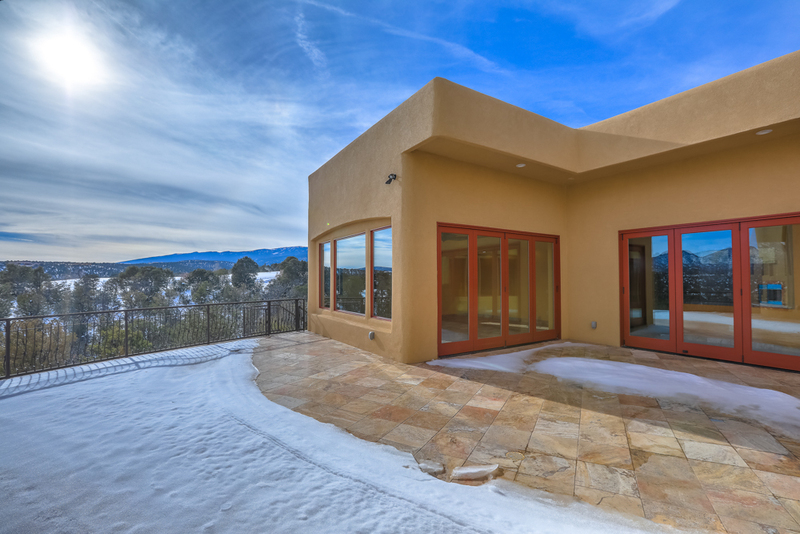 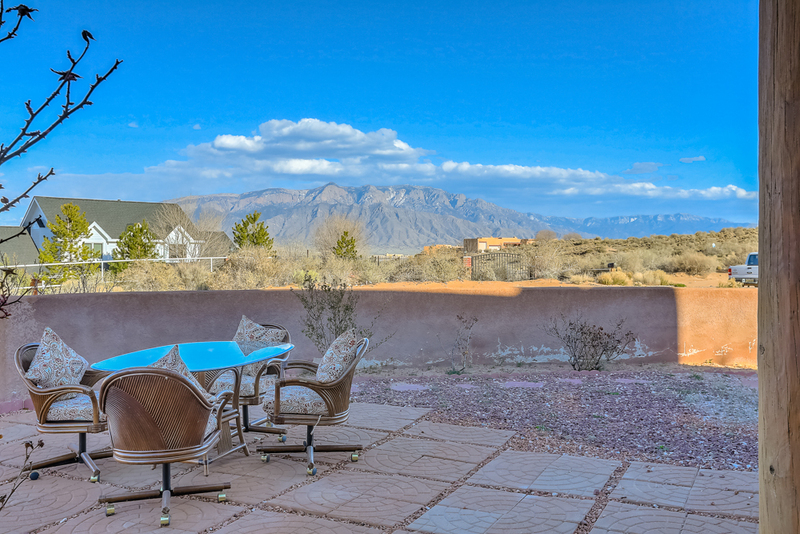 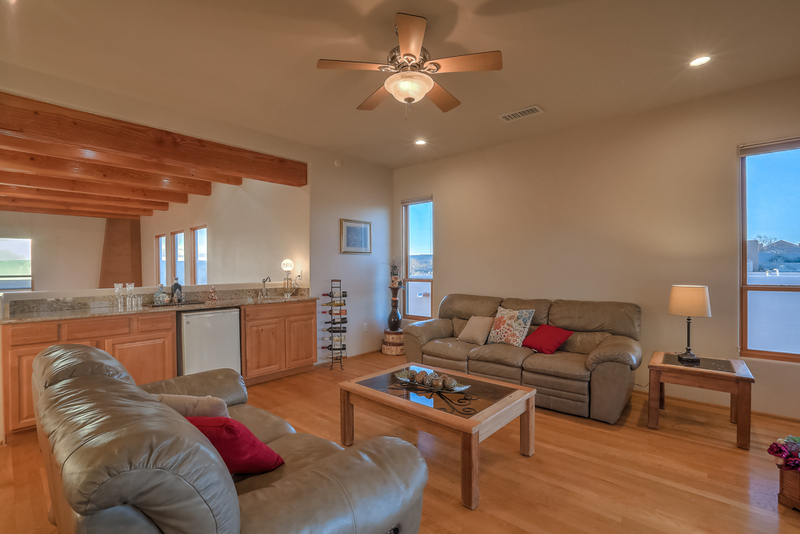 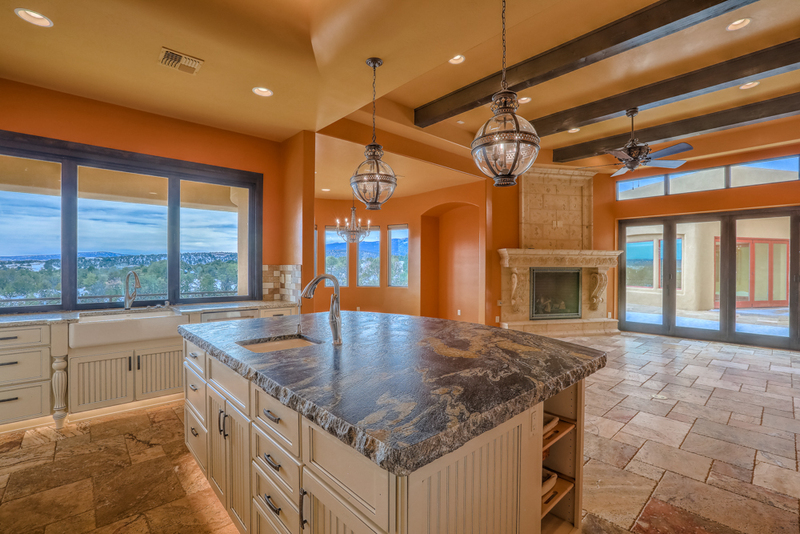 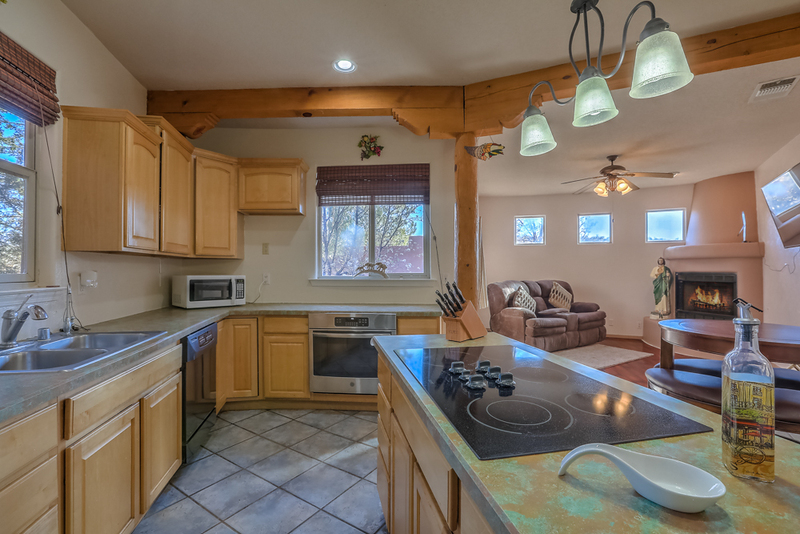 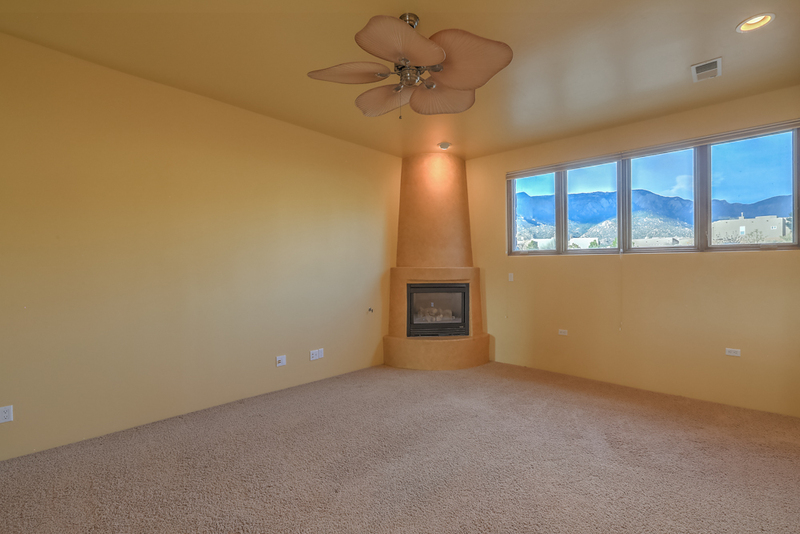 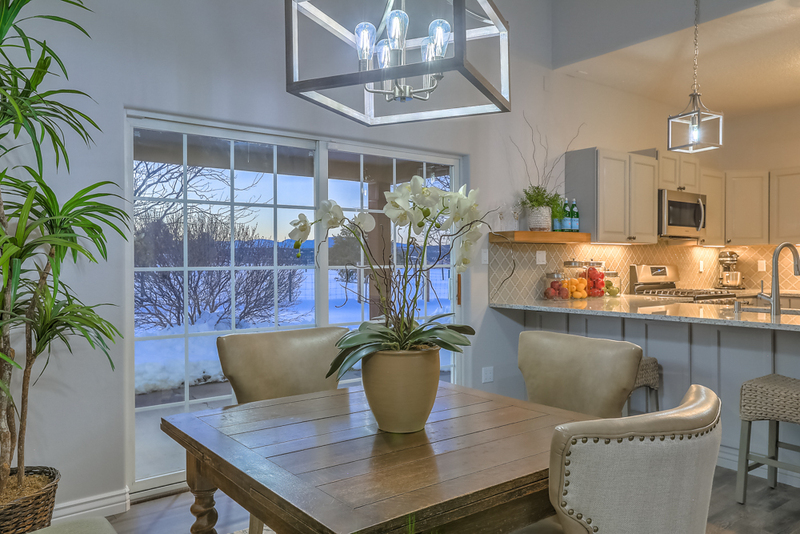 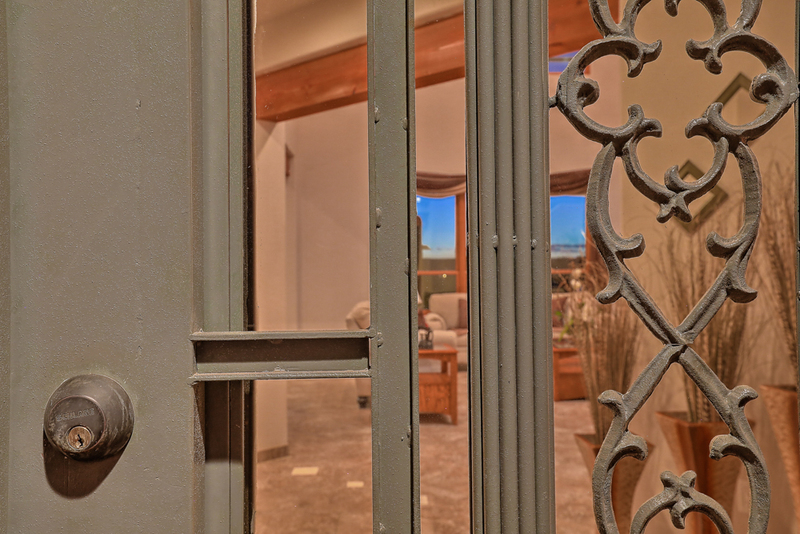 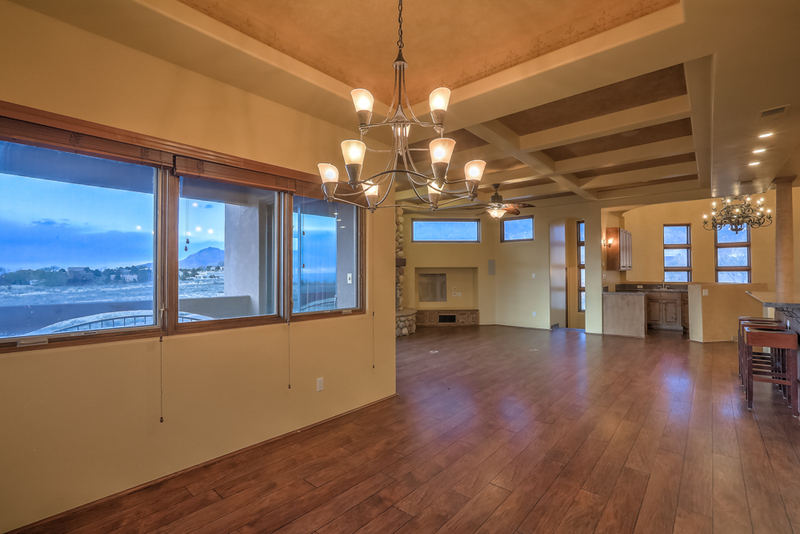 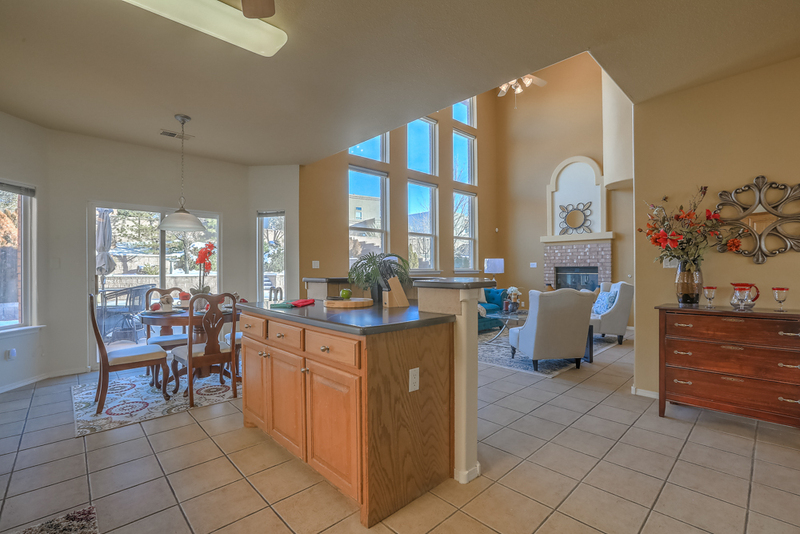 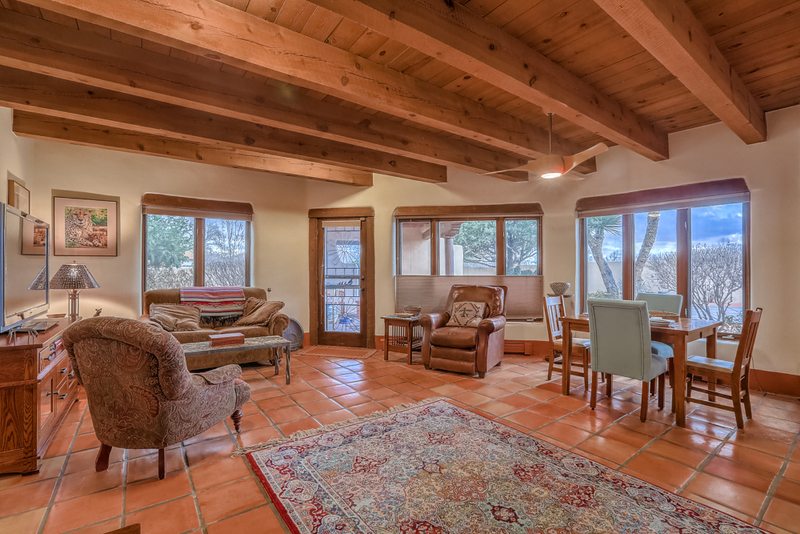 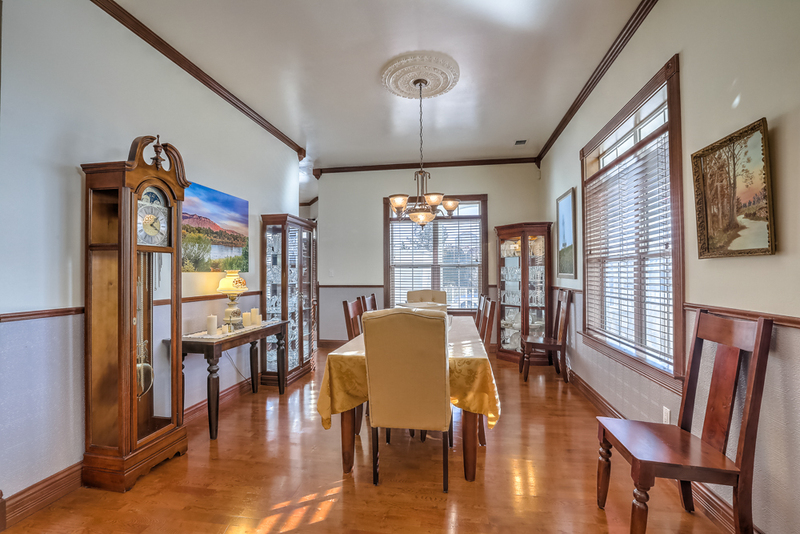 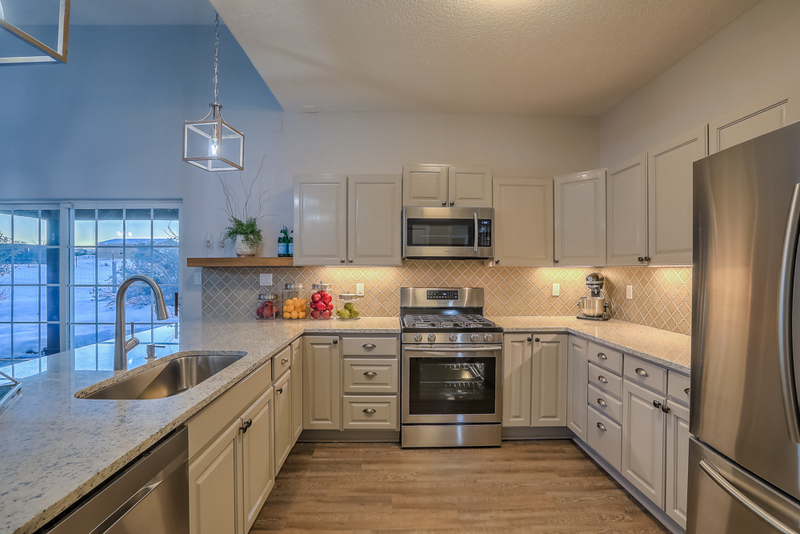 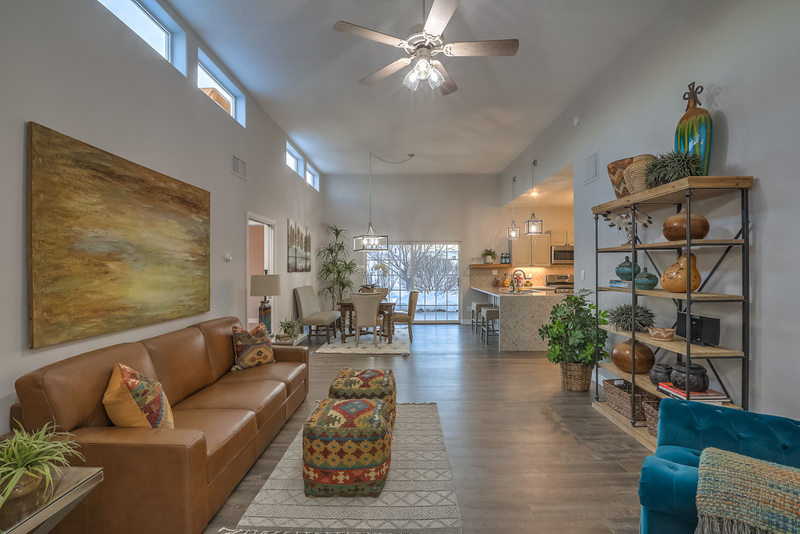 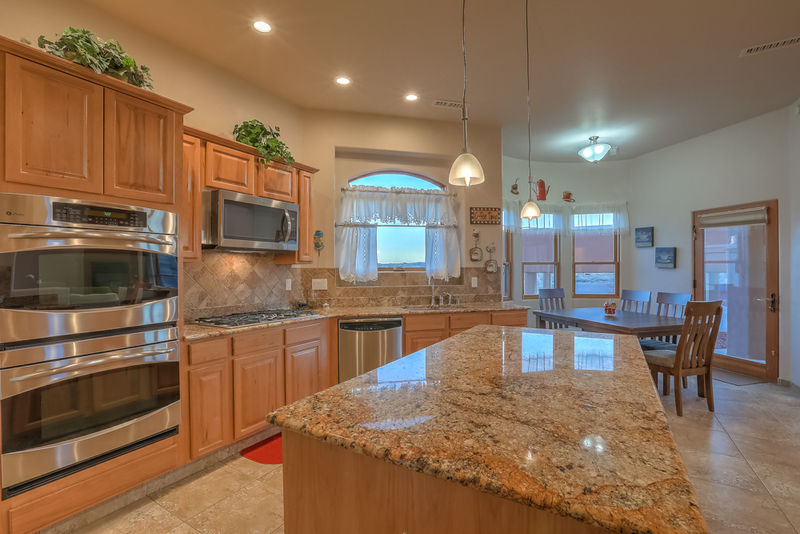 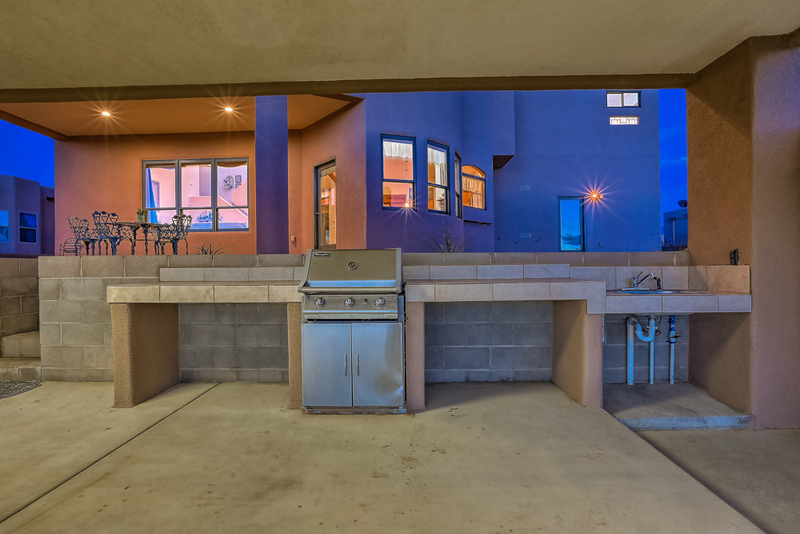 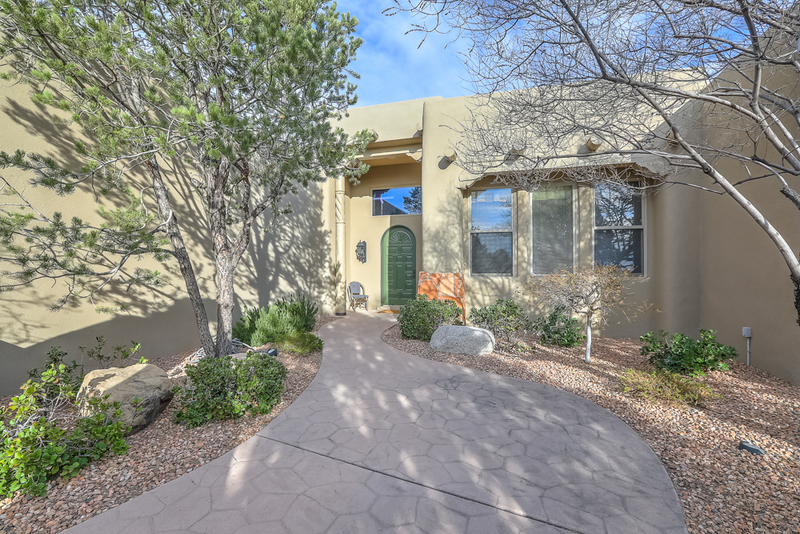 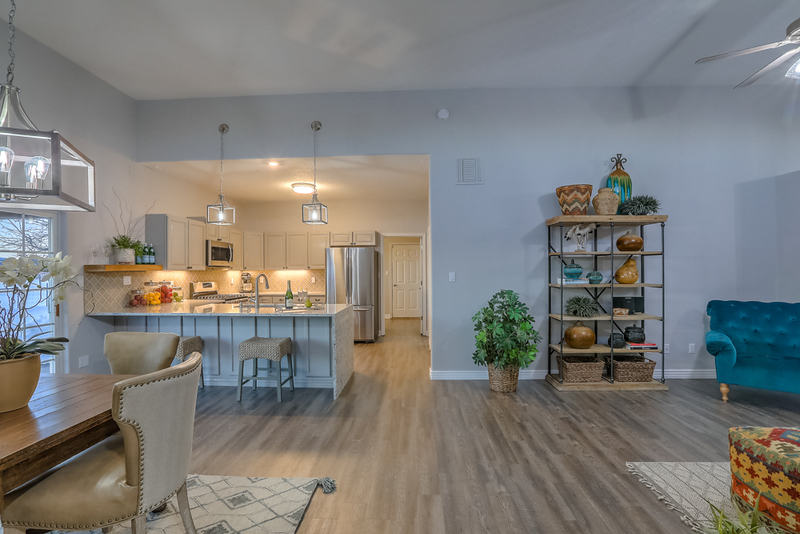 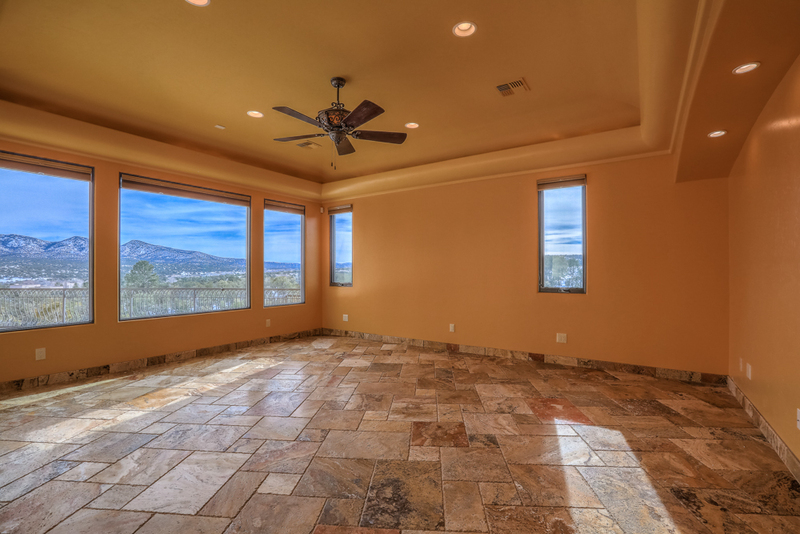 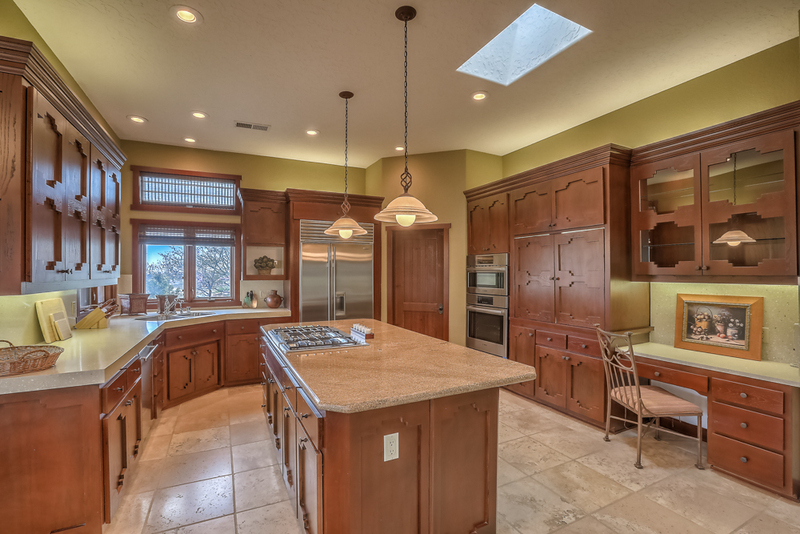 Enjoy the formal dining space and Chef's kitchen offering granite counter tops, custom cabinetry, updated appliances and a beautiful window to see the mountain views. 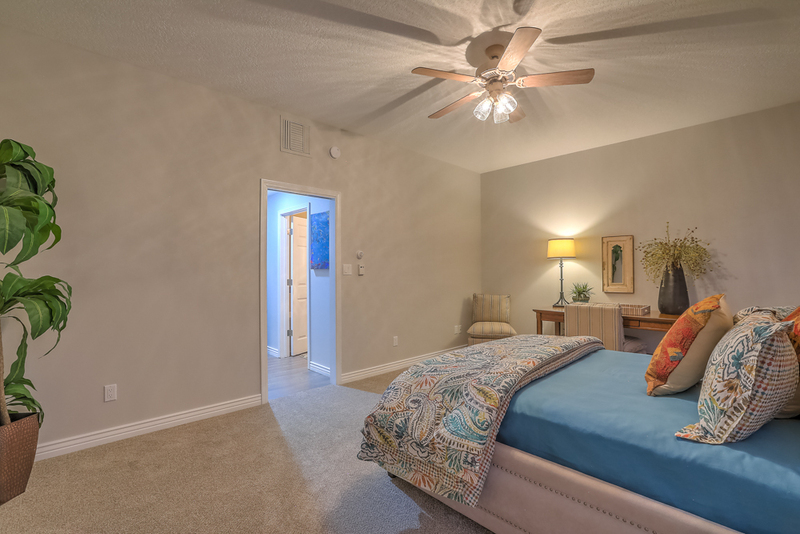 A luxurious master suite awaits with a large, well appointed bath and a walk in closet for the most discriminating buyer- it is huge! 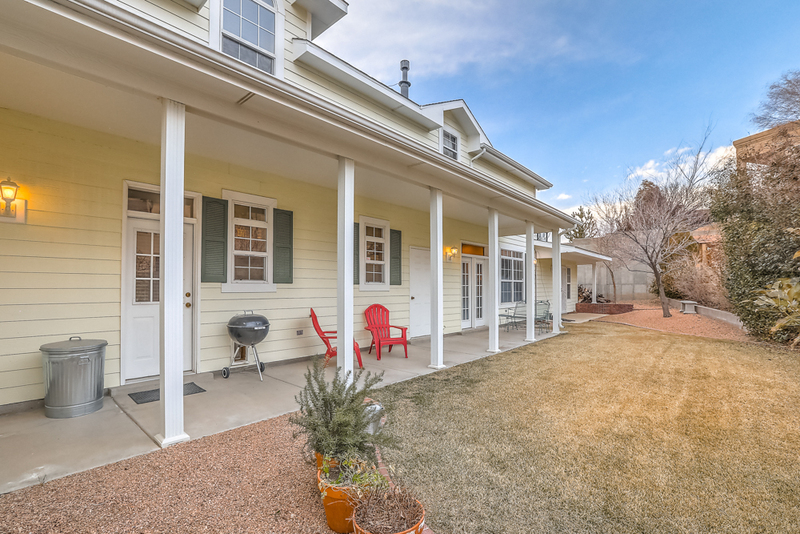 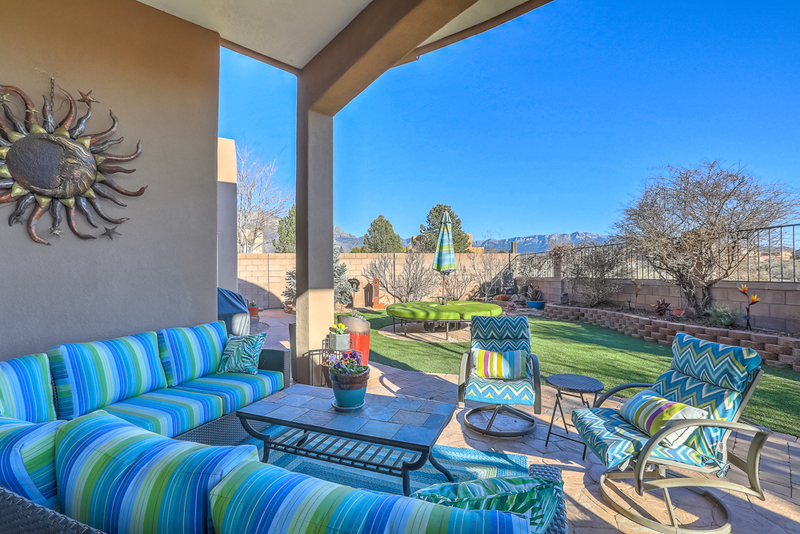 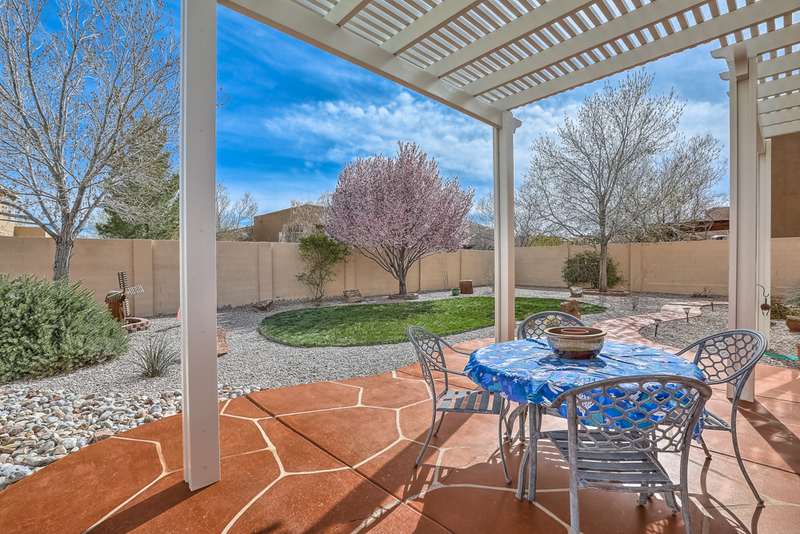 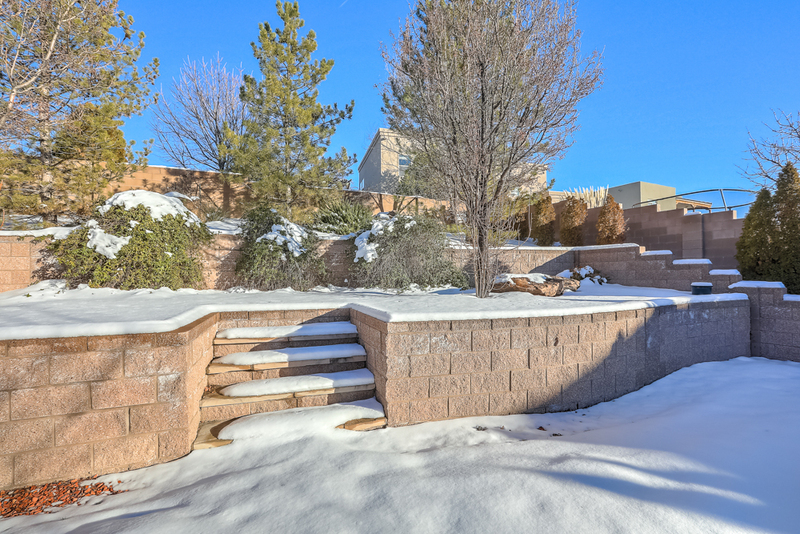 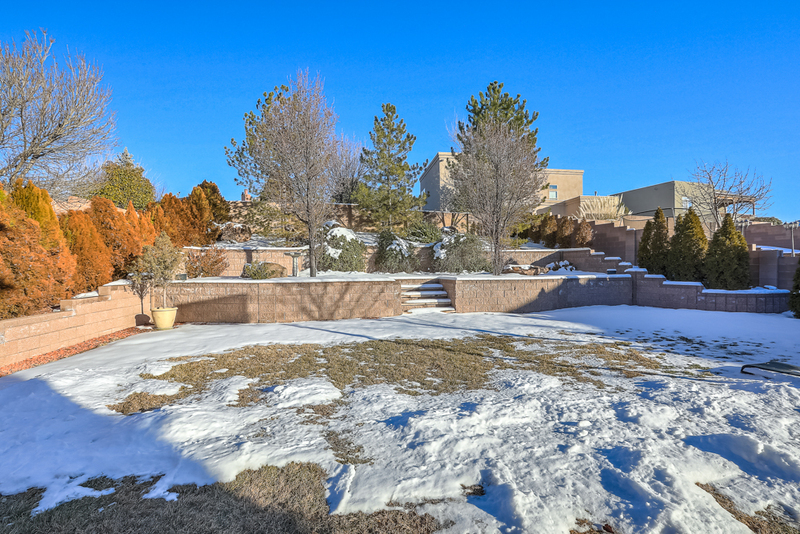 A large backyard for entertaining includes gorgeous landscaping and a newer hot tub! 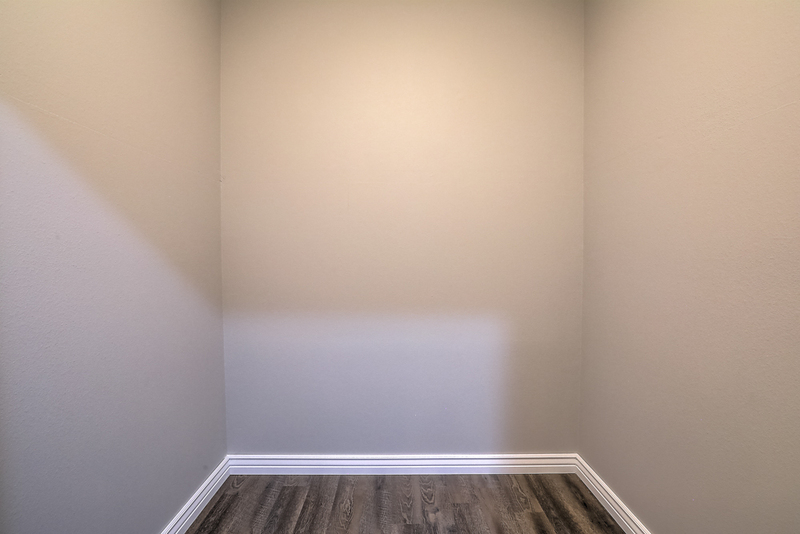 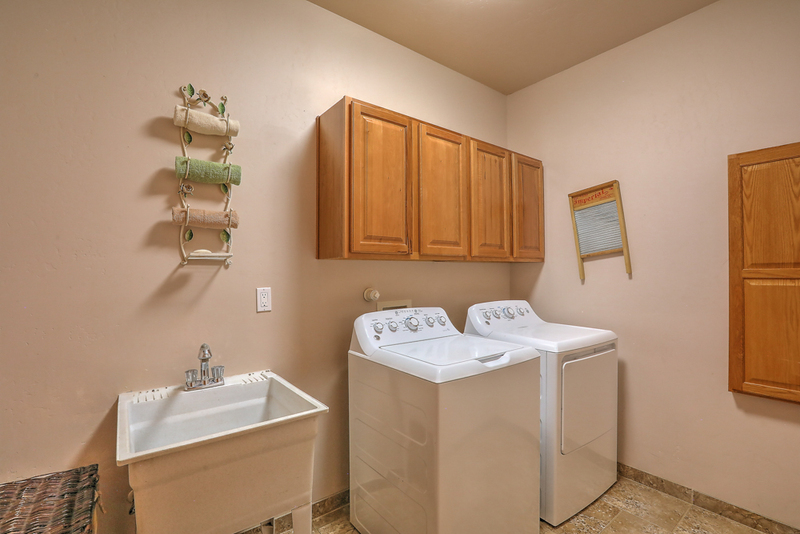 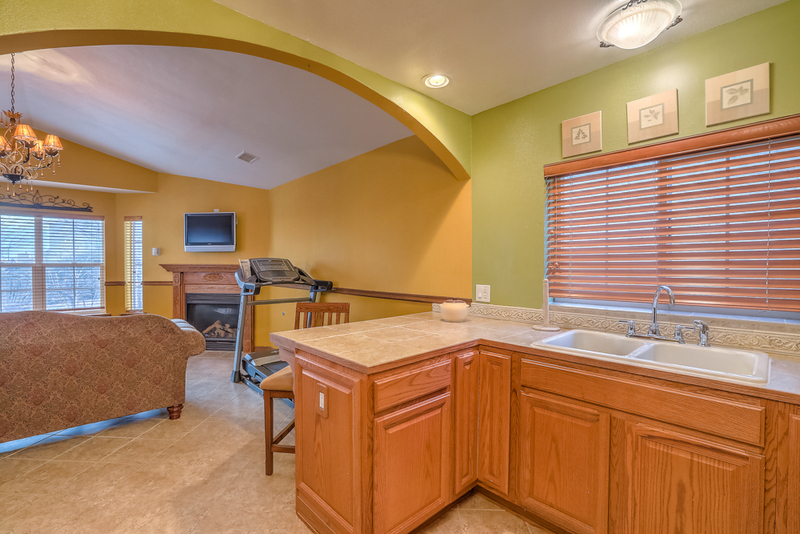 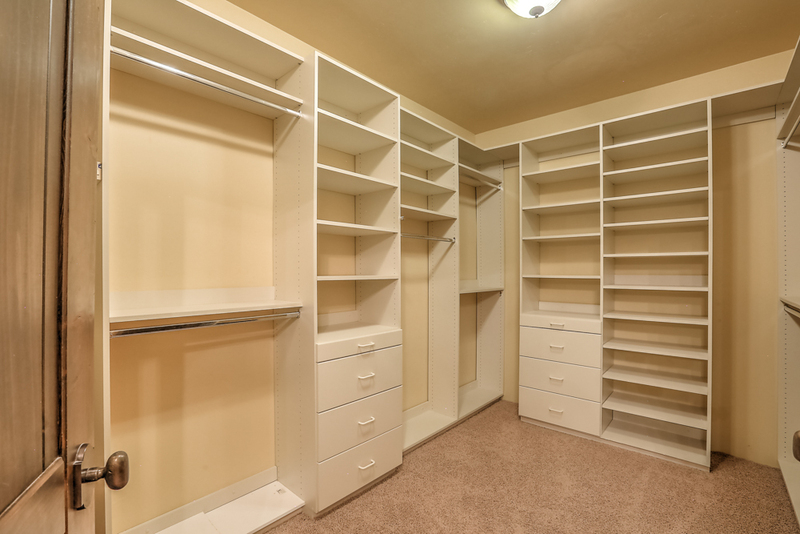 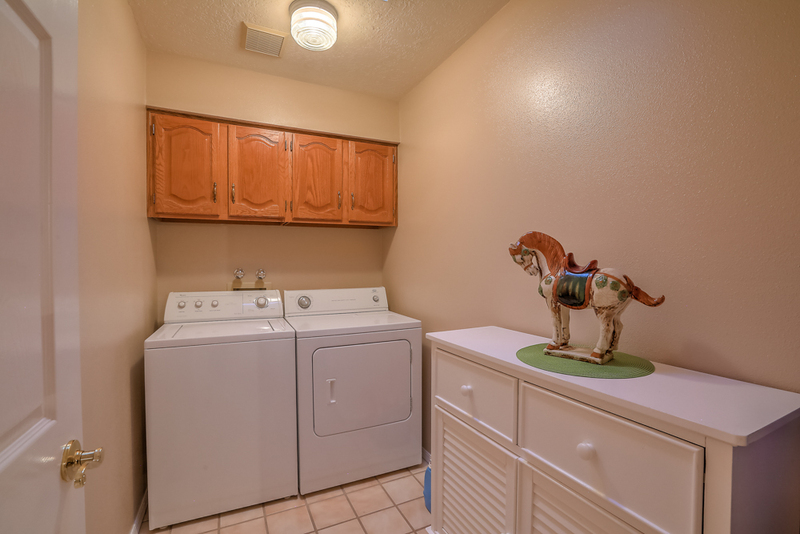 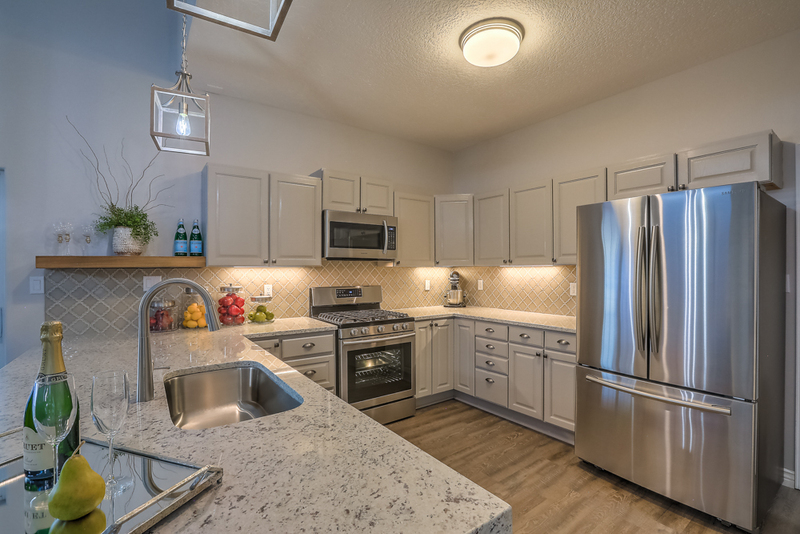 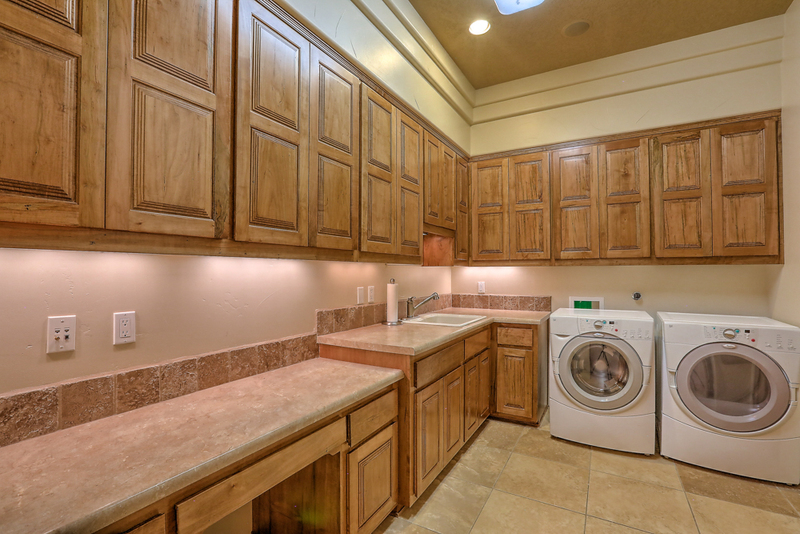 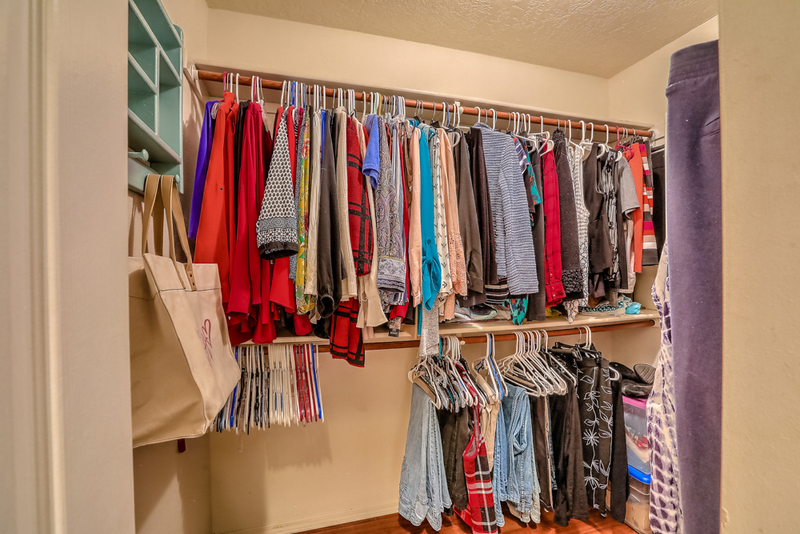 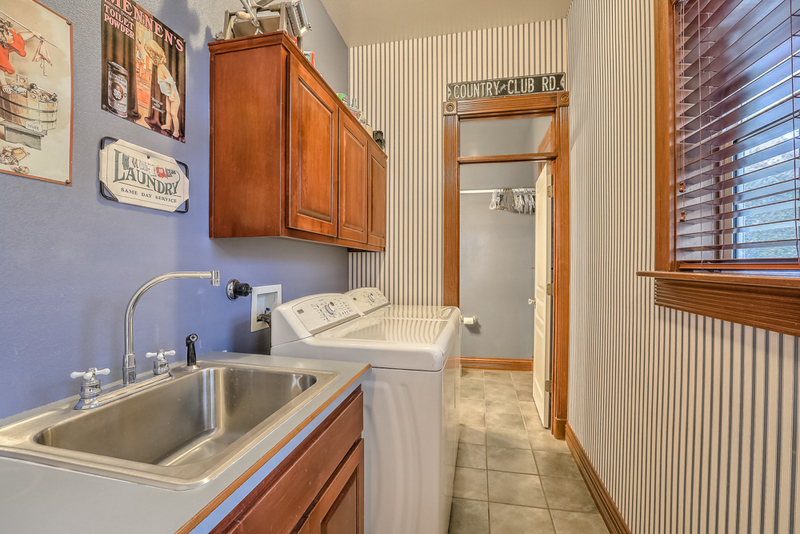 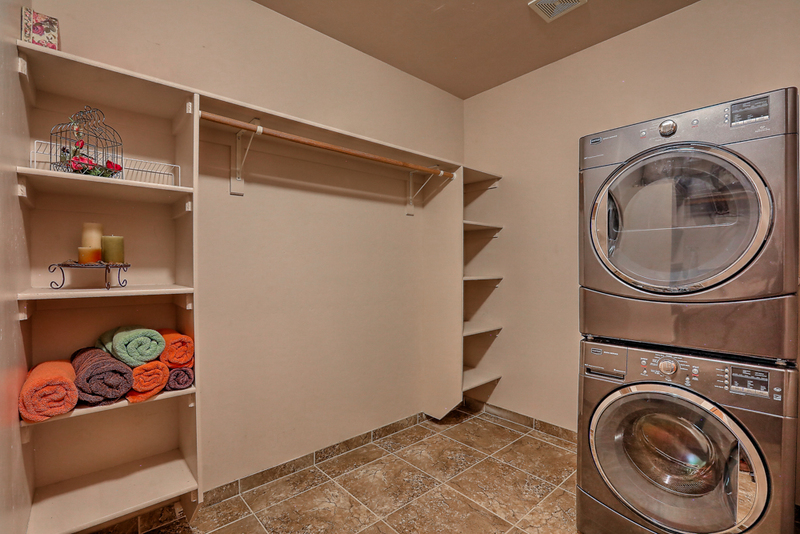 The laundry room is spacious and large, including extra storage! 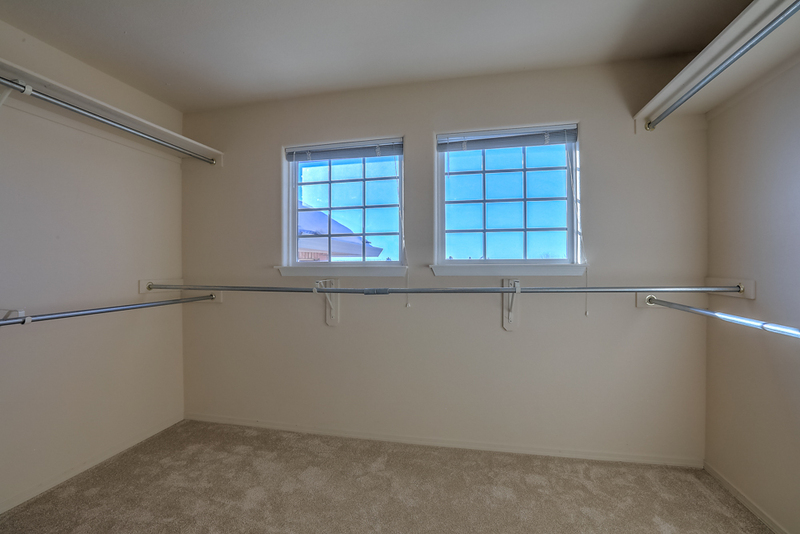 Don't forget the 3 car garage. 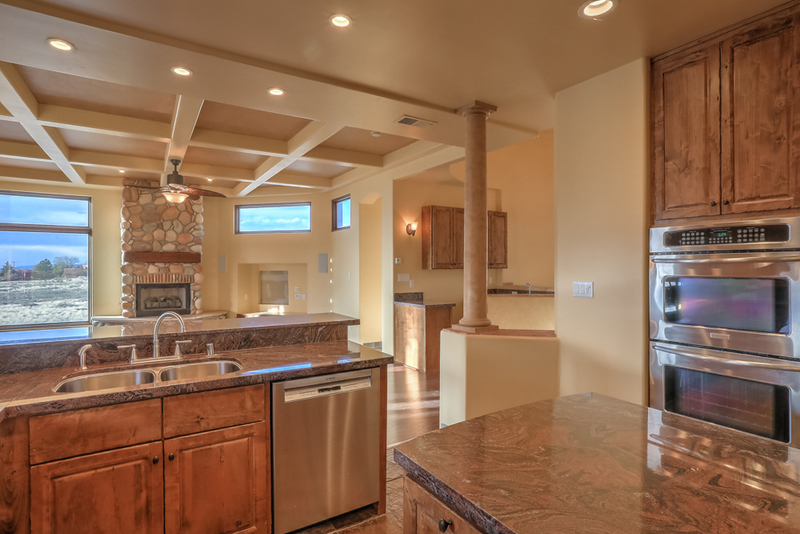 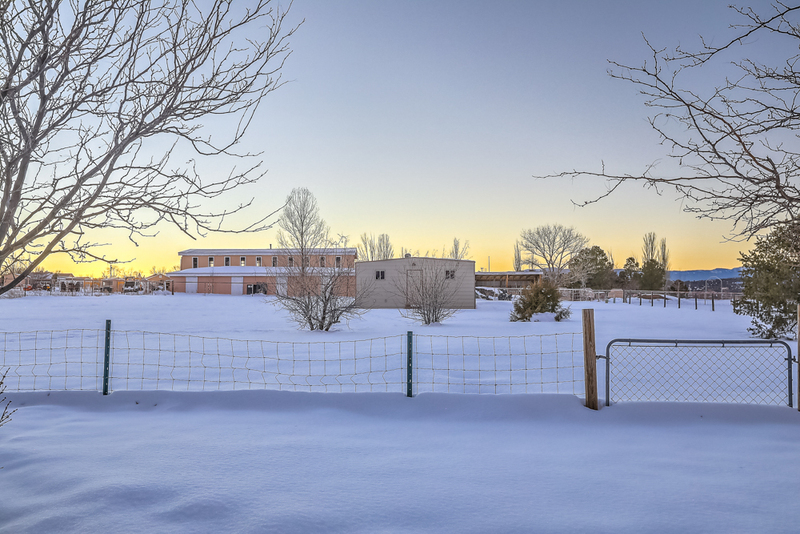 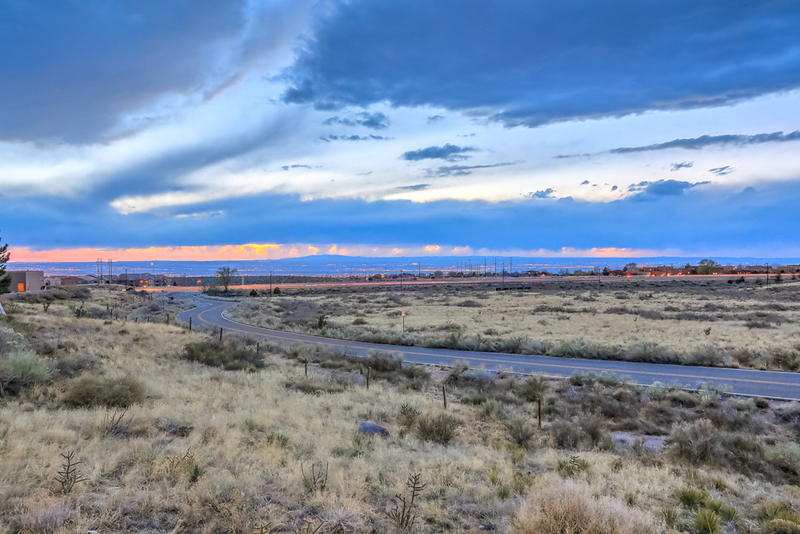 The home has a new refrigerated air system and is in move in ready condition. 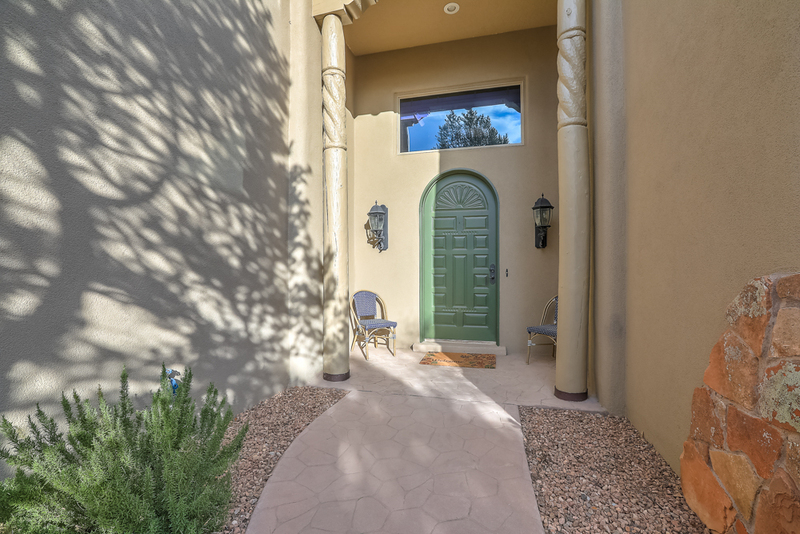 Don't miss this gorgeous custom dream home boasting a serene courtyard leading to the stunning imported iron & glass front entry door. 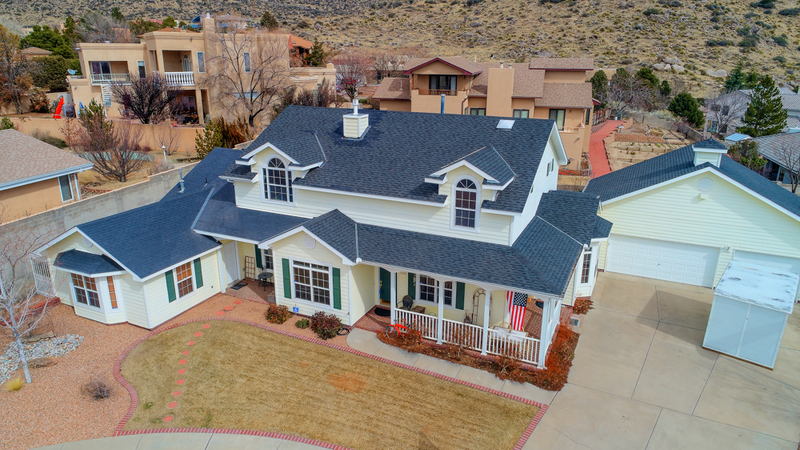 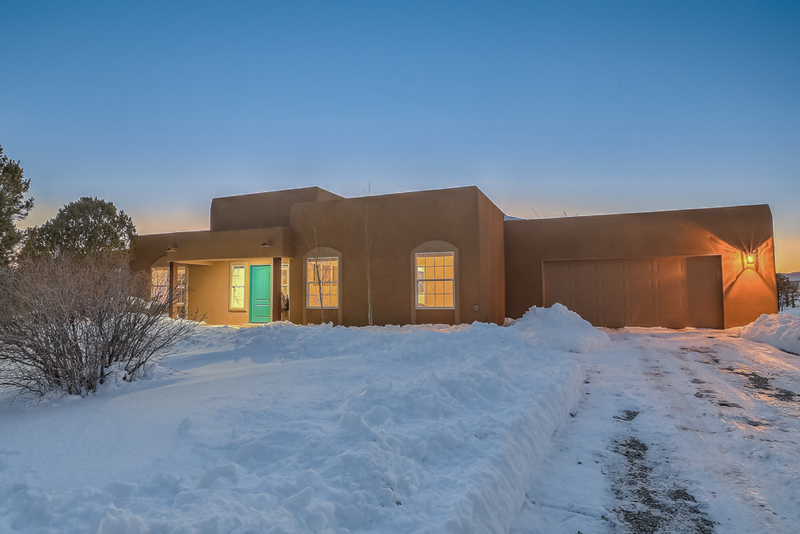 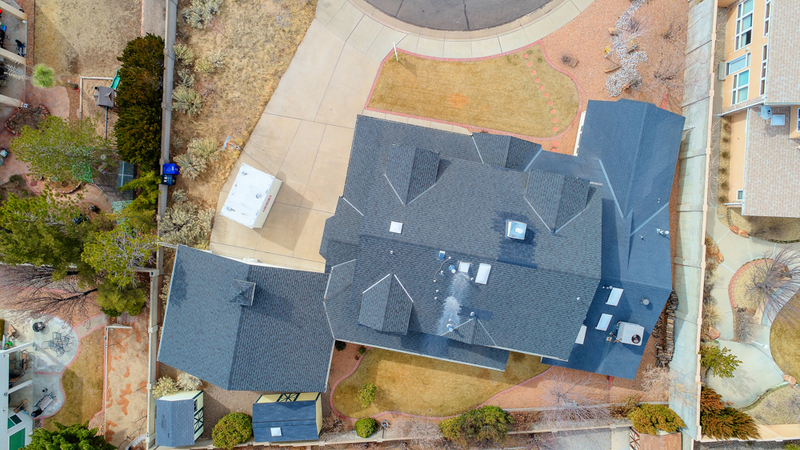 4 bedrooms, 3 full baths, 2 laundry rooms for convenience.. Main level has a great room with soaring ceilings and fireplace, chef's dream kitchen with granite counters, stainless appliances, double oven, gas cooktop, huge walk-in pantry, breakfast nook and formal dining room. 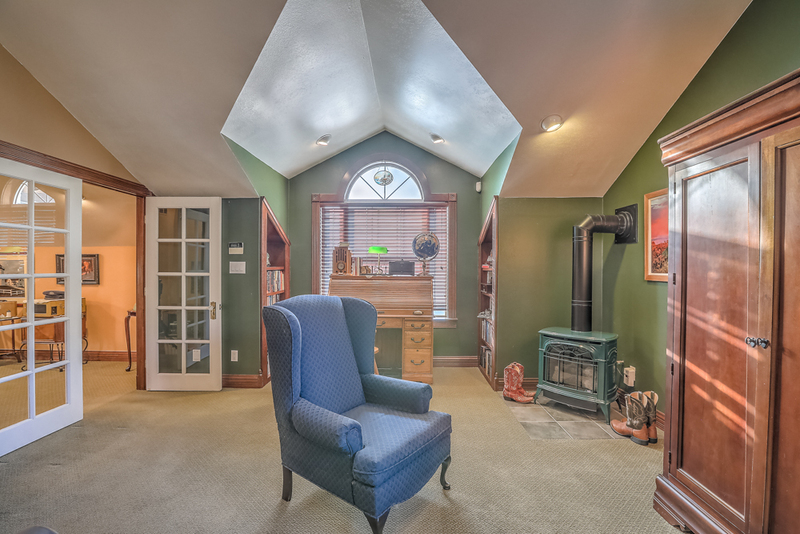 Upper level King sized owner's suite features sitting area, fireplace, spacious spa-like bath and enormous 14.6' walk-in closet with 2nd laundry, deck/patio. 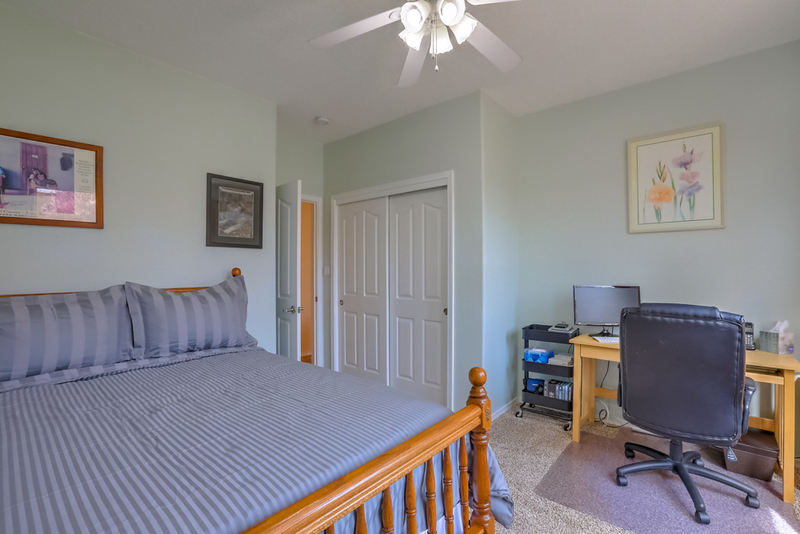 2 additional generous sized bedrooms. 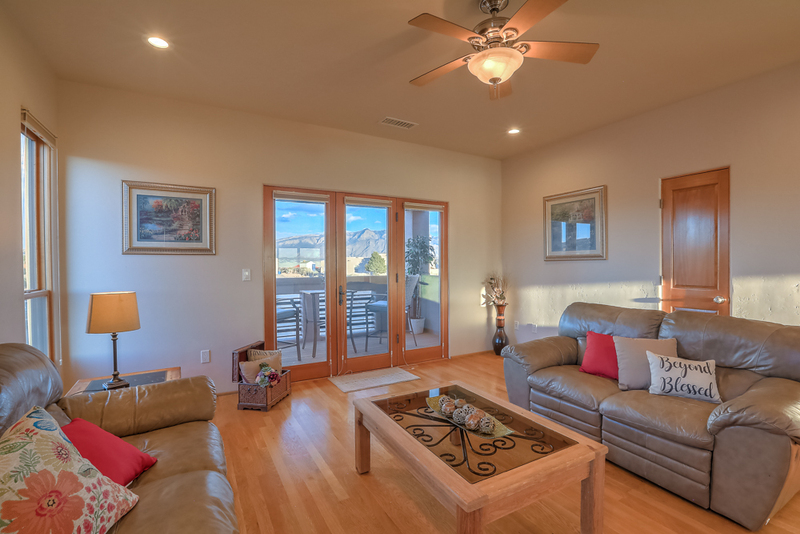 Loft with deck magnificent mountain views. 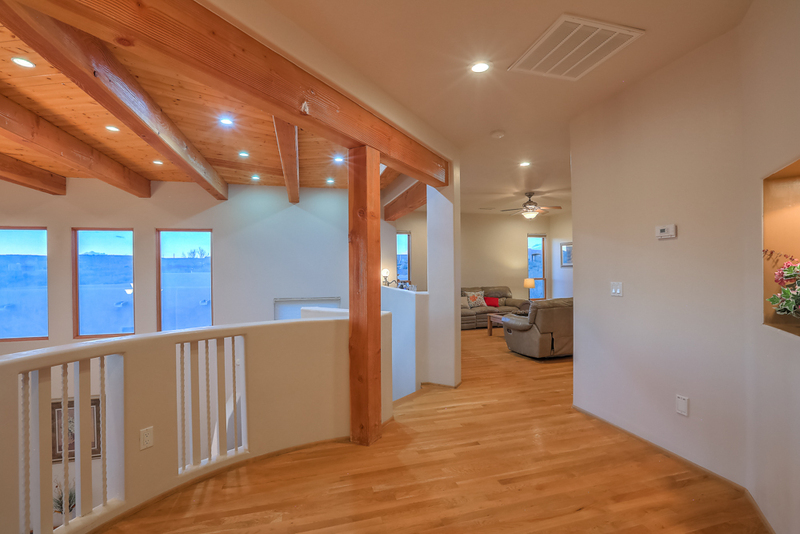 Main level has in-floor radiant heat + forced air. 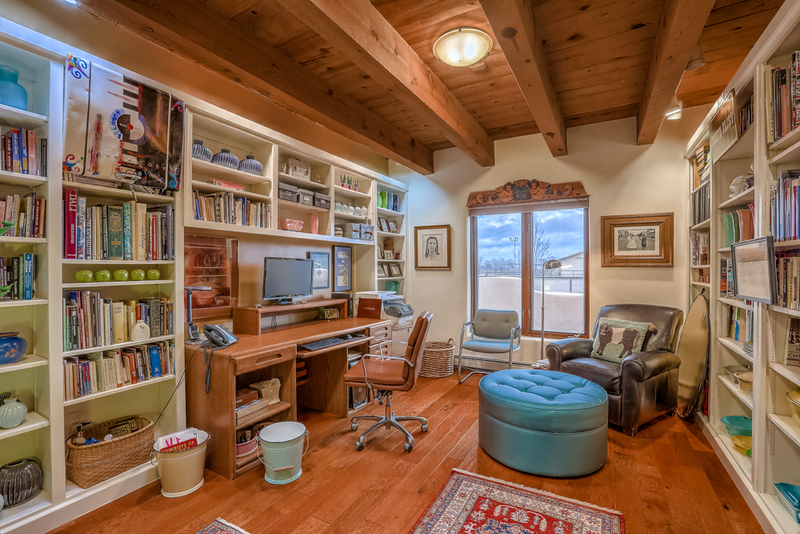 Heated & cooled office/storage inside oversized 2 car finished garage. 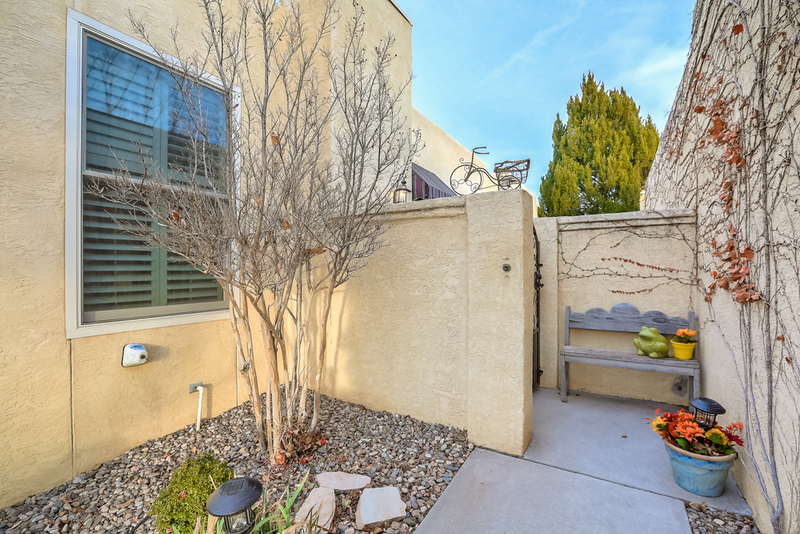 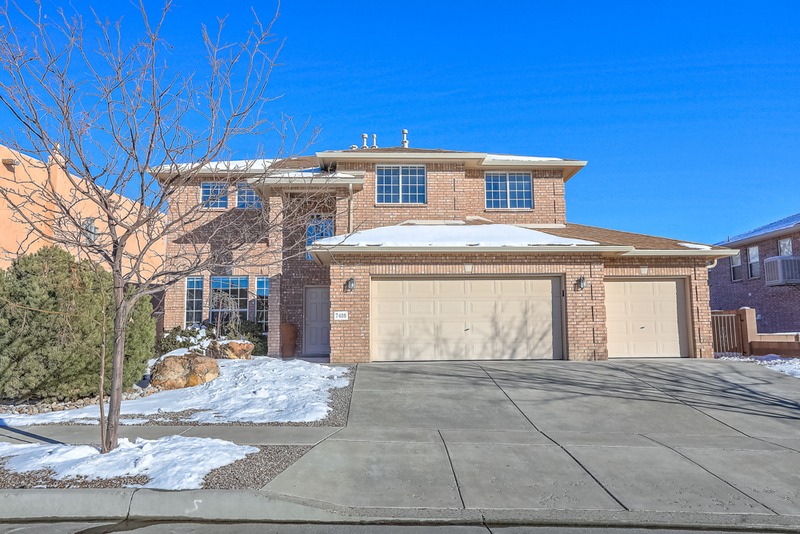 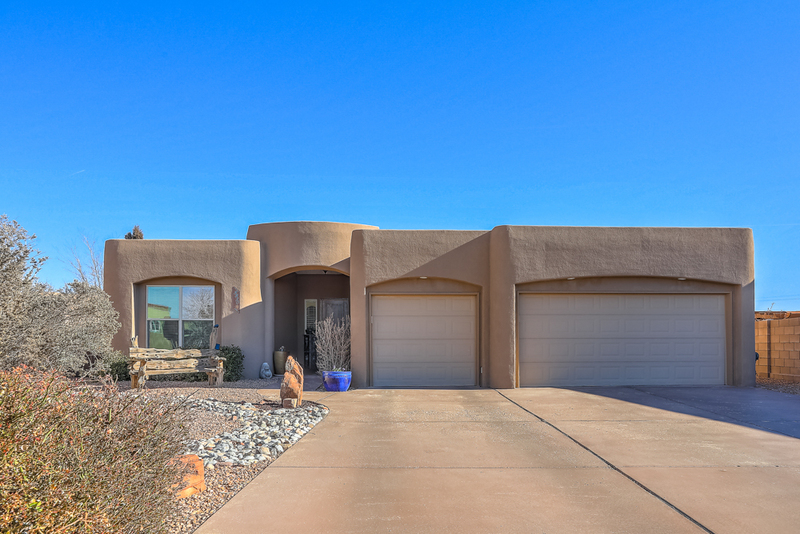 Welcome home to this gorgeous 4 bedroom 3 bathroom 3 car garage in Enchanted Hills neighborhood. 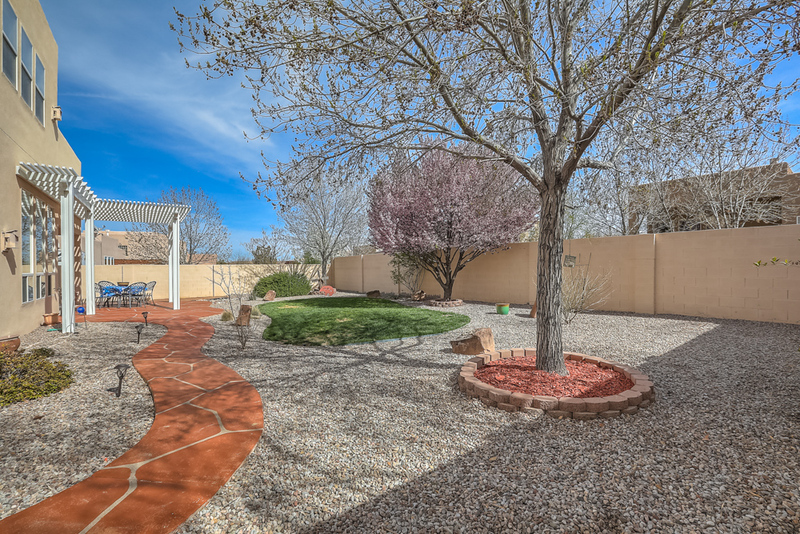 This home offers side yard parking and backyard access, perfect for those with RVs and toys for storage. 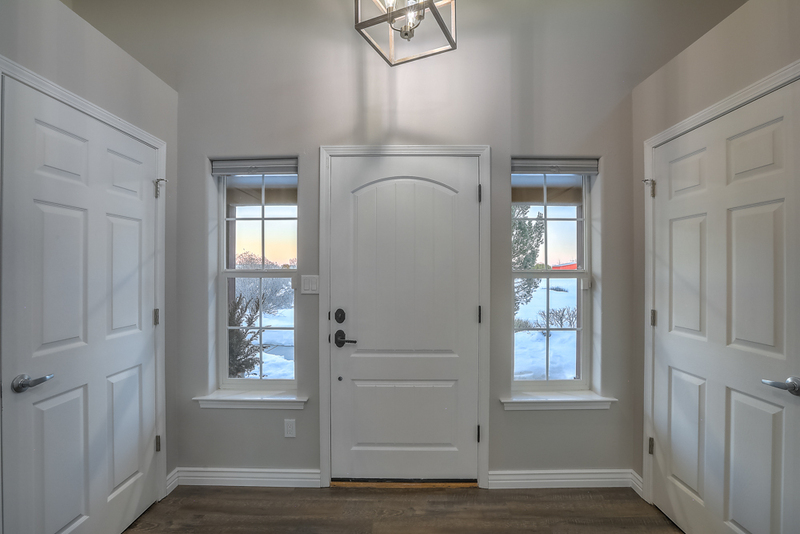 Walk in and enjoy the open concept - to the left is a large office space or optional extra room with beautiful wood glass framed double doors. 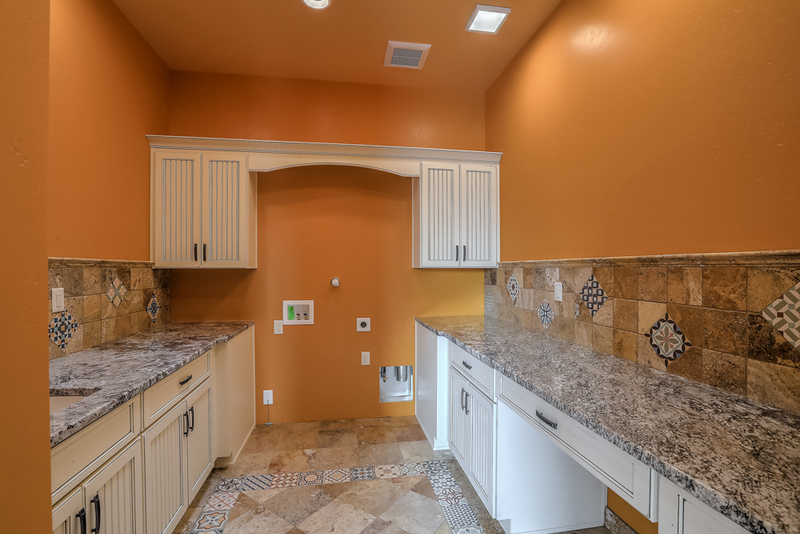 Enjoy the custom tiling throughout with beautiful mosaic designs. 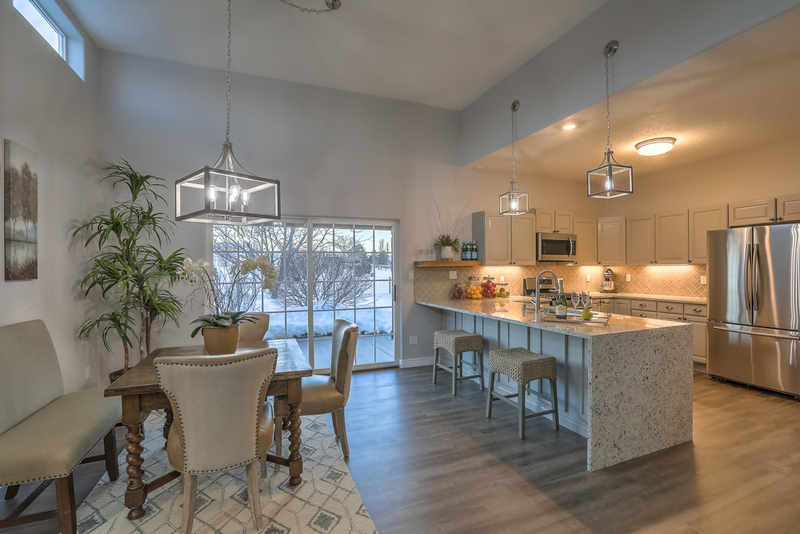 As you enter into the main living areas you can see that the dining, kitchen and living space all flow nicely into each other for a great open entertaining experience. 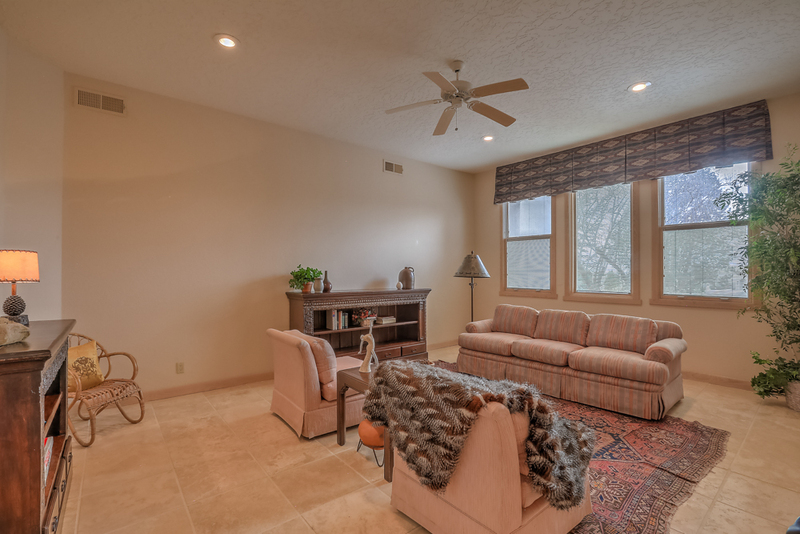 Sit on the sofa in the living room and enjoy the large windows which let in tons of natural lighting and the cozy stone fireplace. 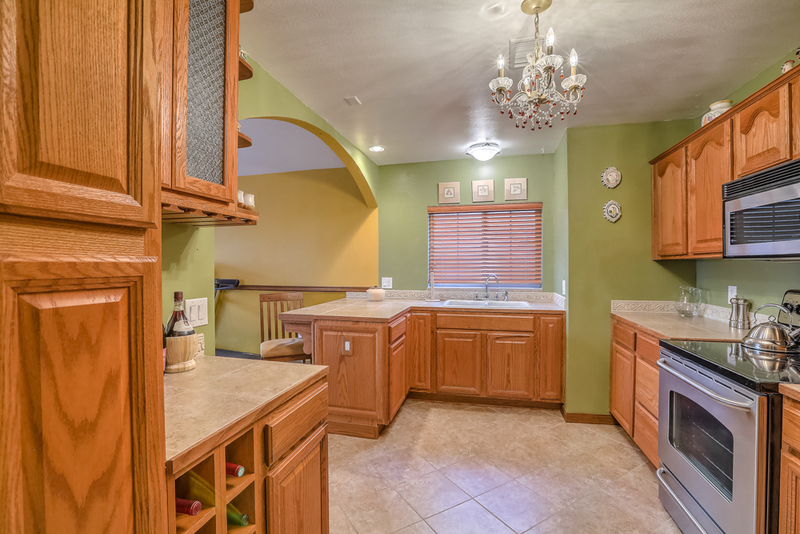 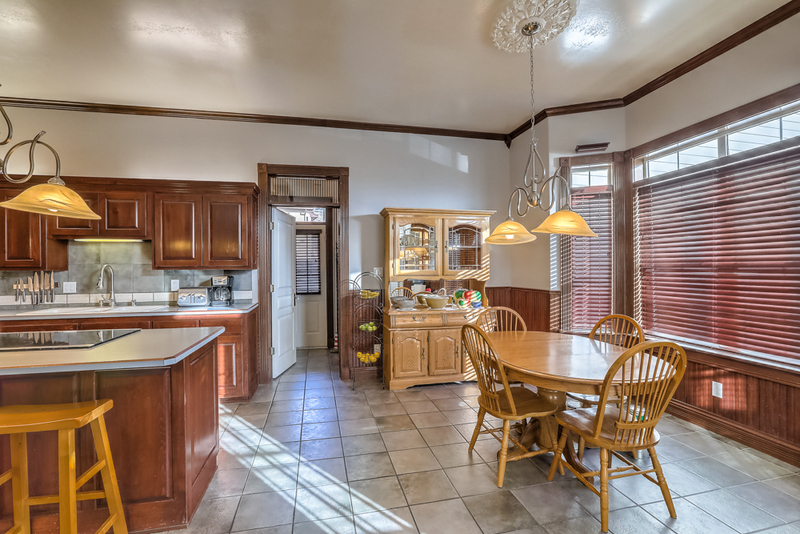 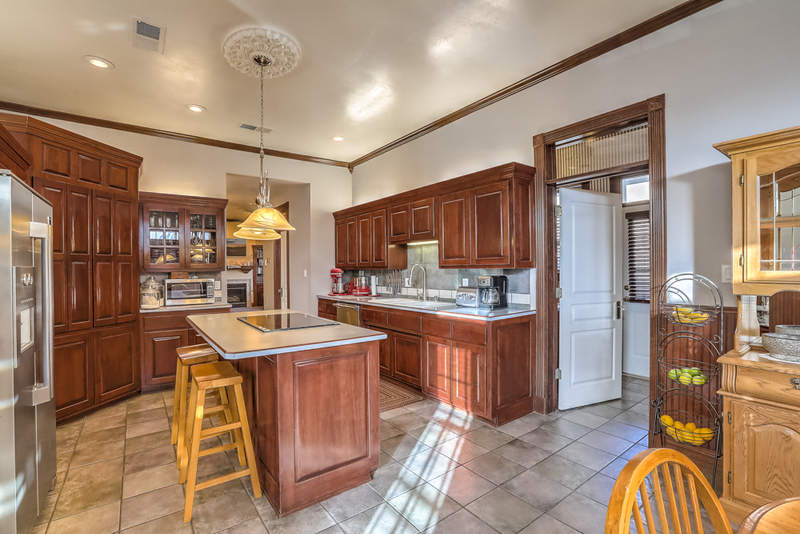 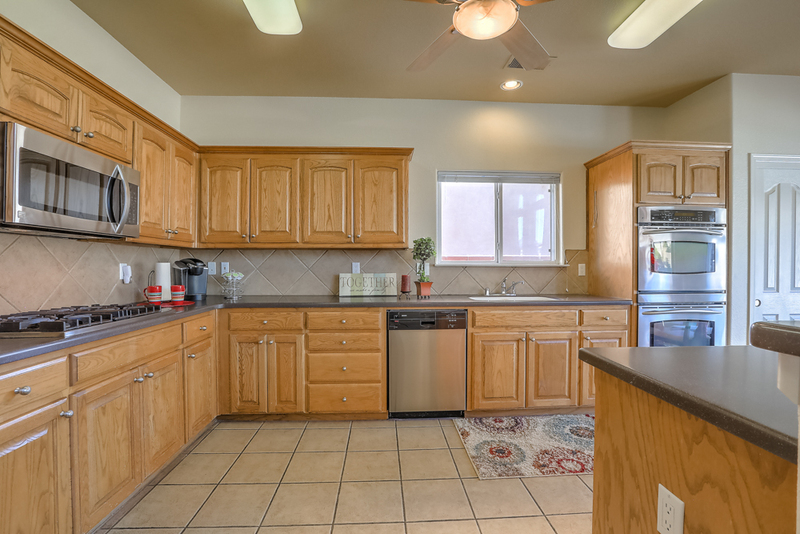 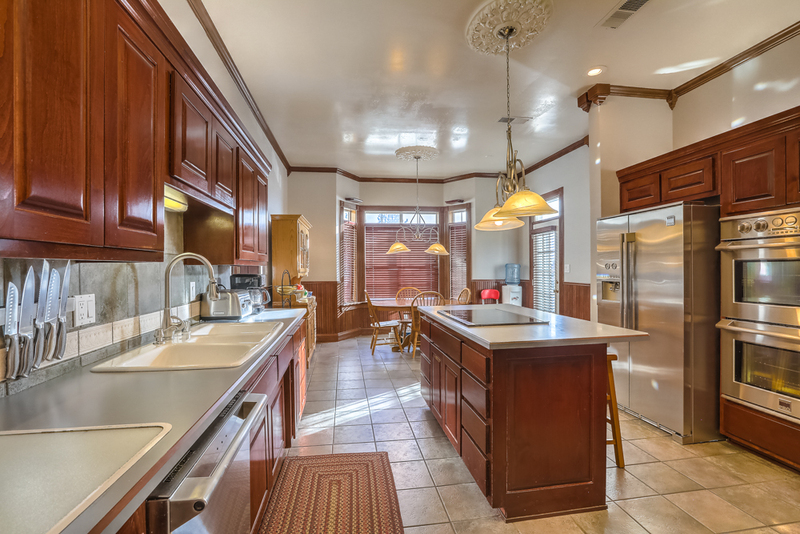 The kitchen has tiled backsplash, breakfast nook, double oven, walk-in pantry, large island, and an additional dining area. 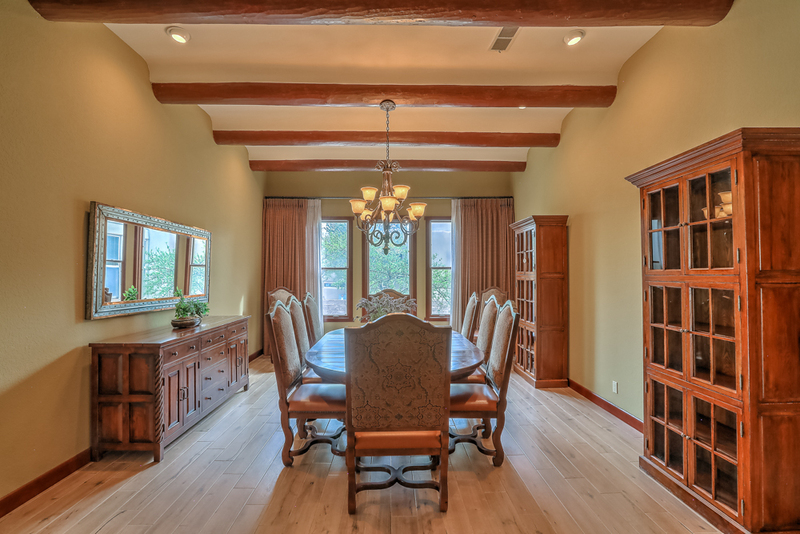 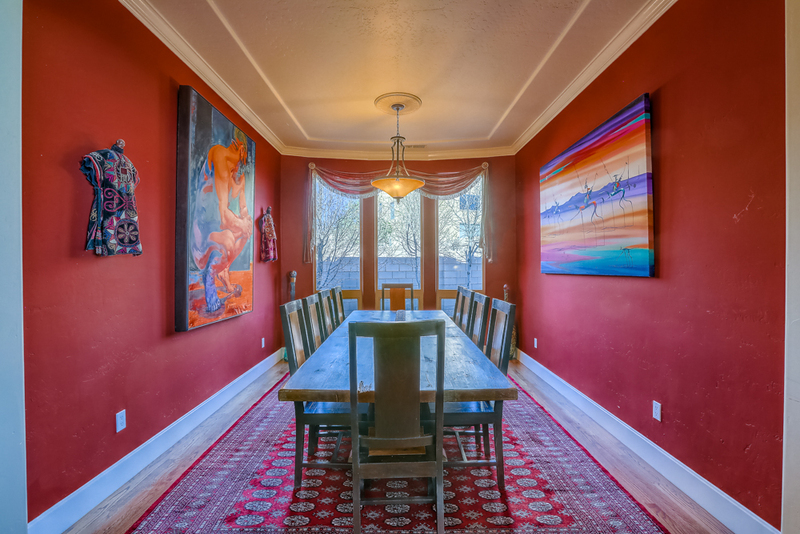 The formal dining space has large double doors that go out to the covered patio space and gorgeous backyard. 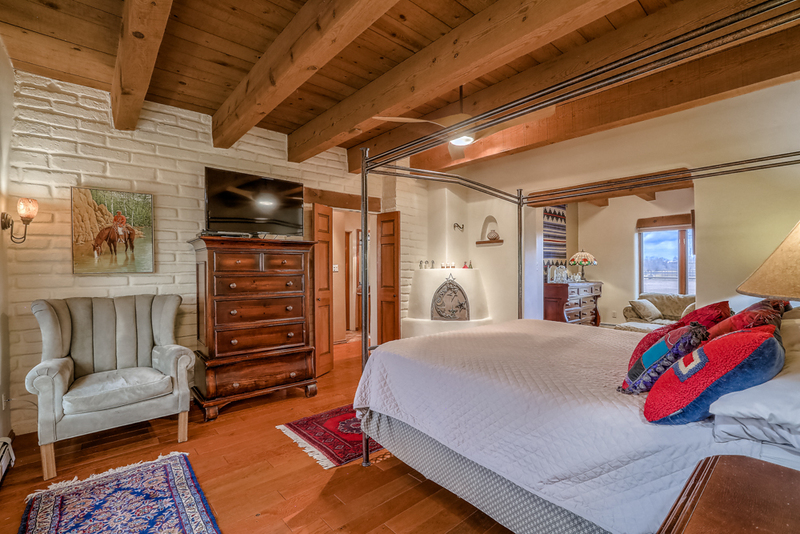 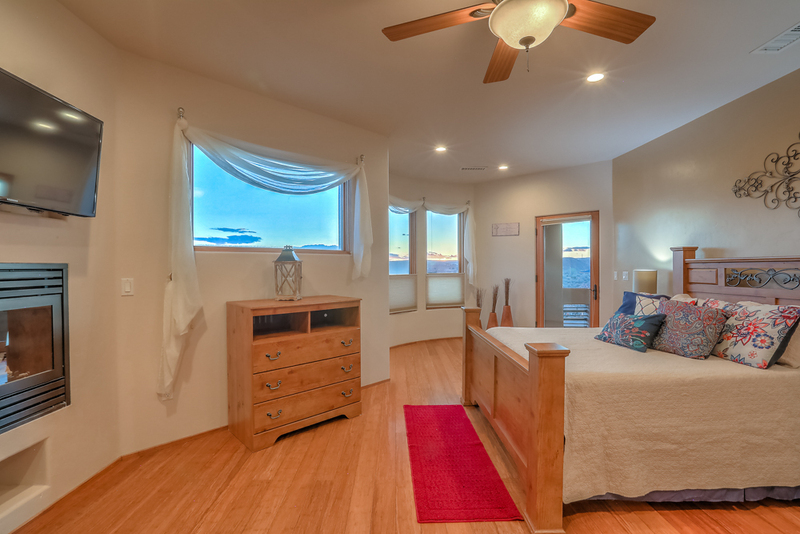 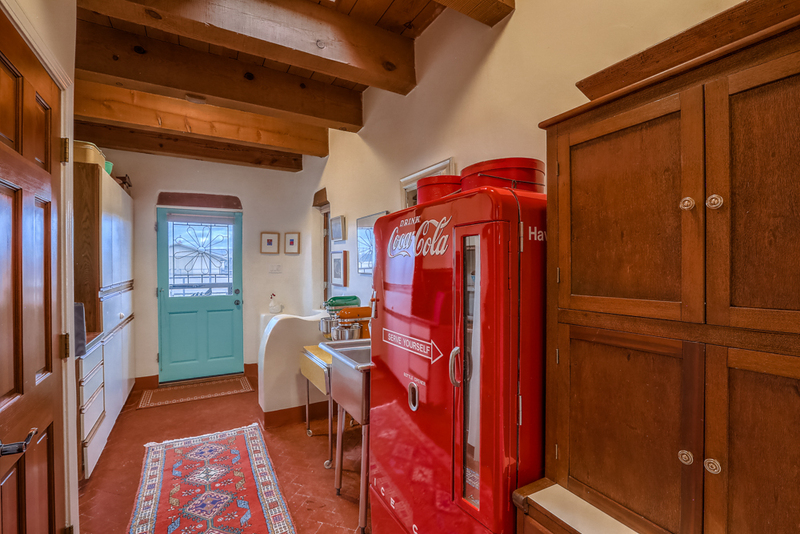 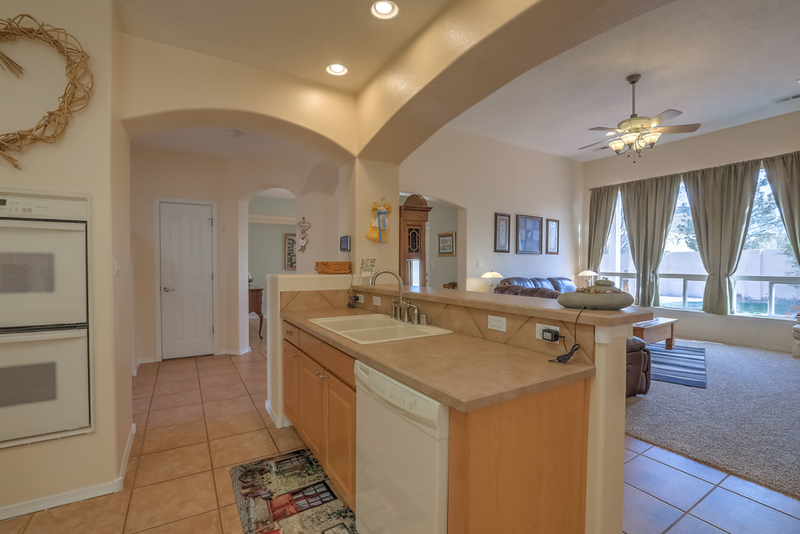 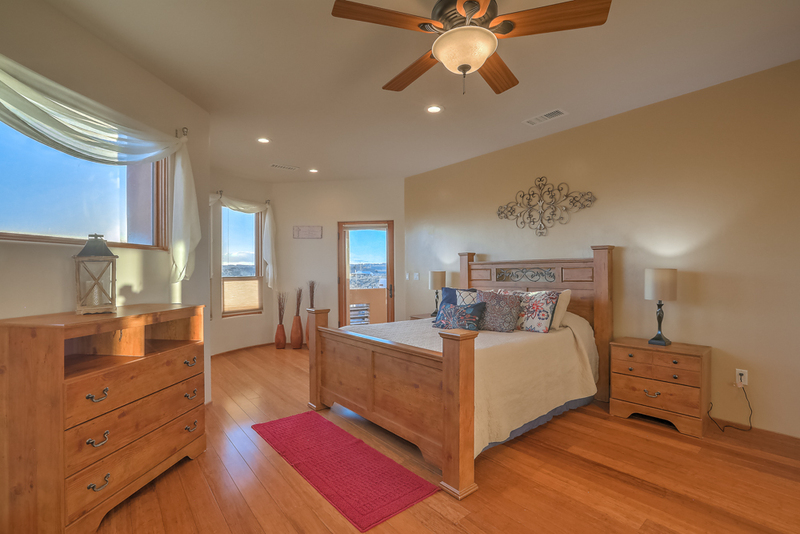 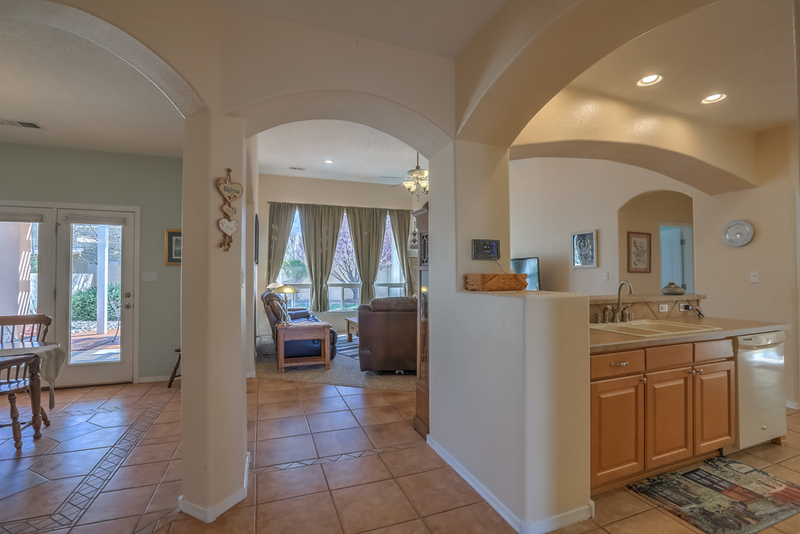 The downstairs also has an extra bedroom with full bathroom which is perfect for visiting guests or in-laws quarters. 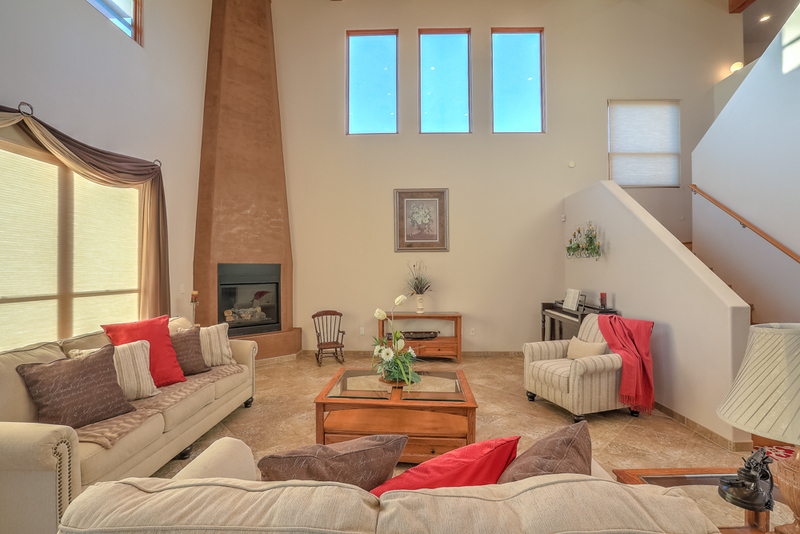 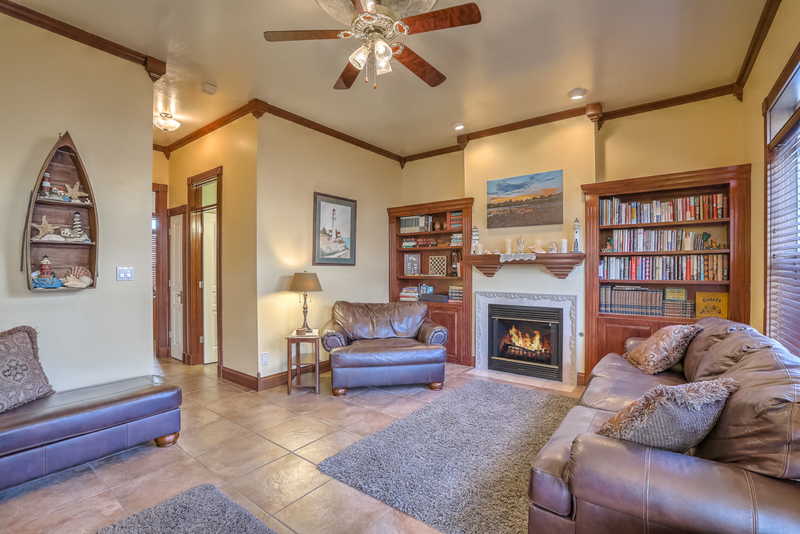 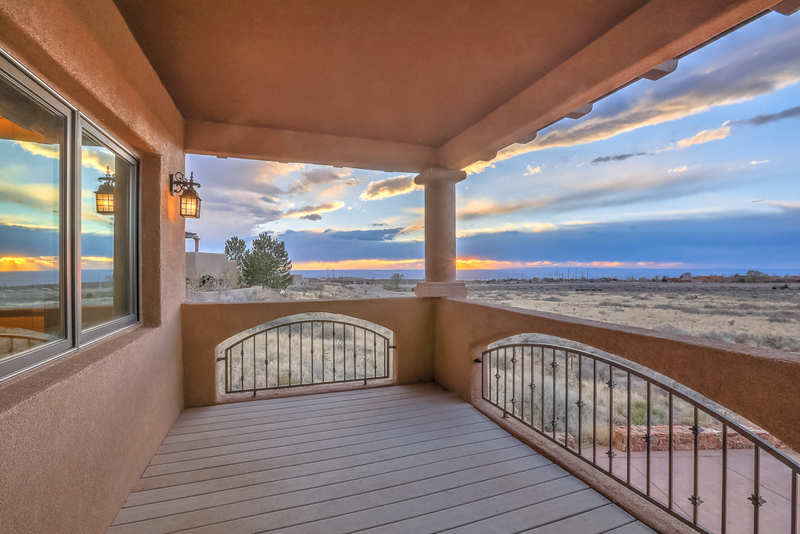 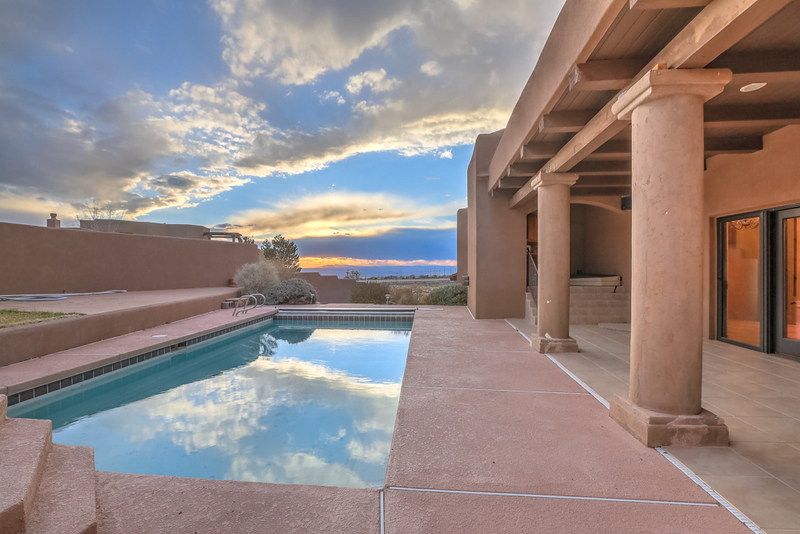 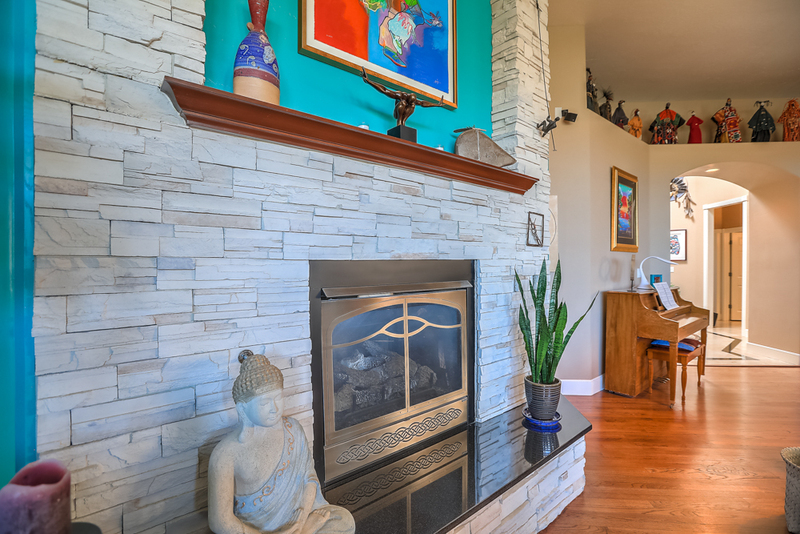 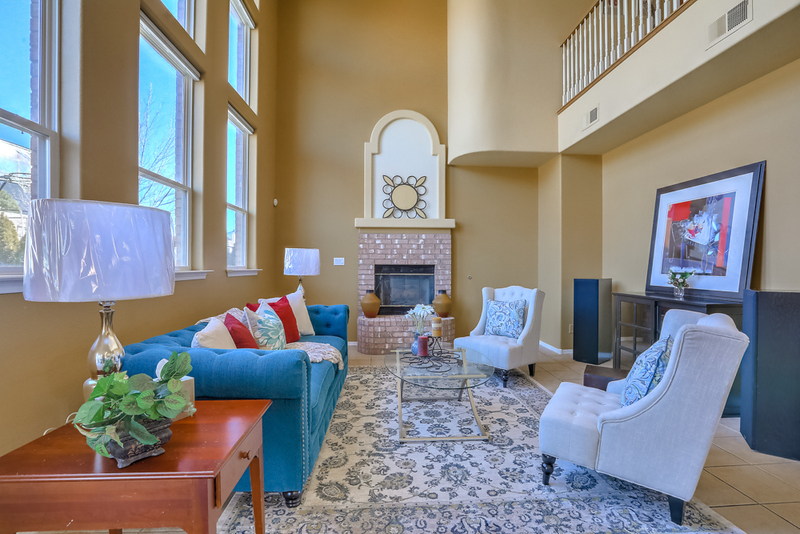 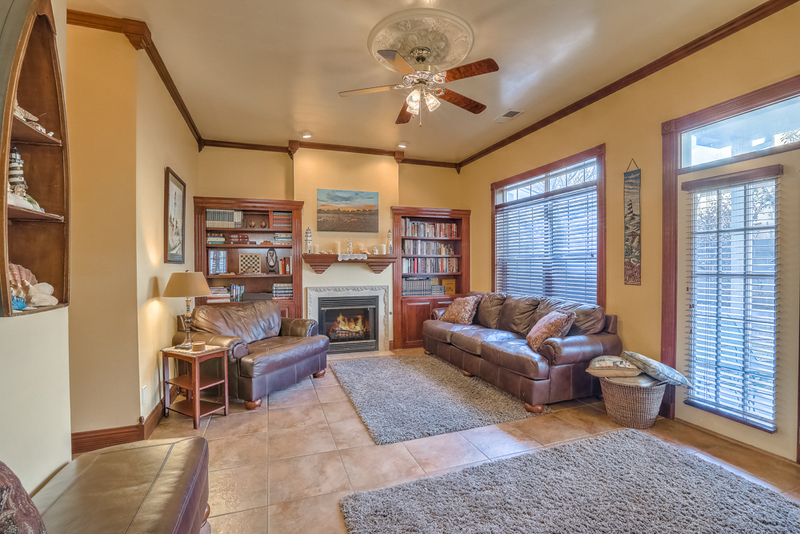 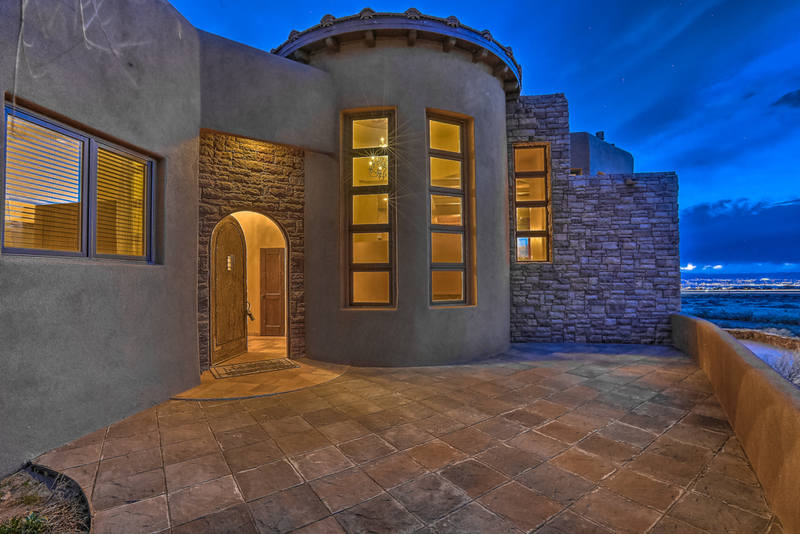 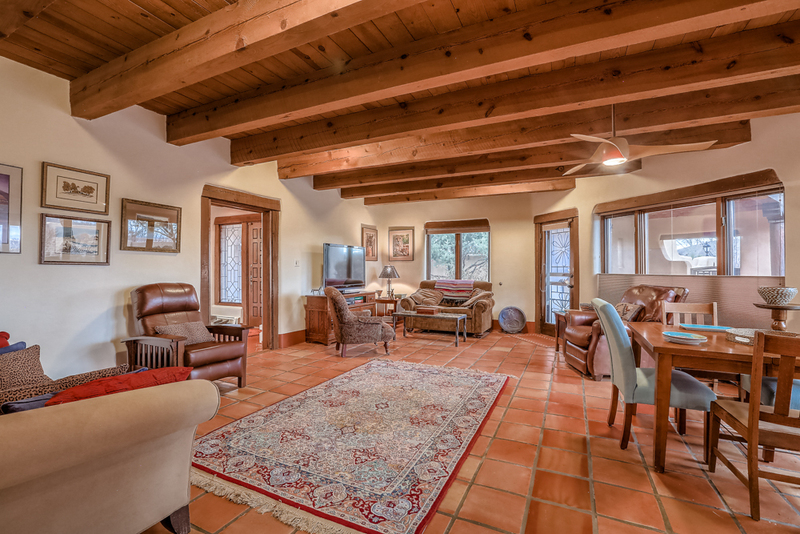 Walk upstairs and enjoy the master suite with tiled fireplace and private access to the upstairs patio (with a view). 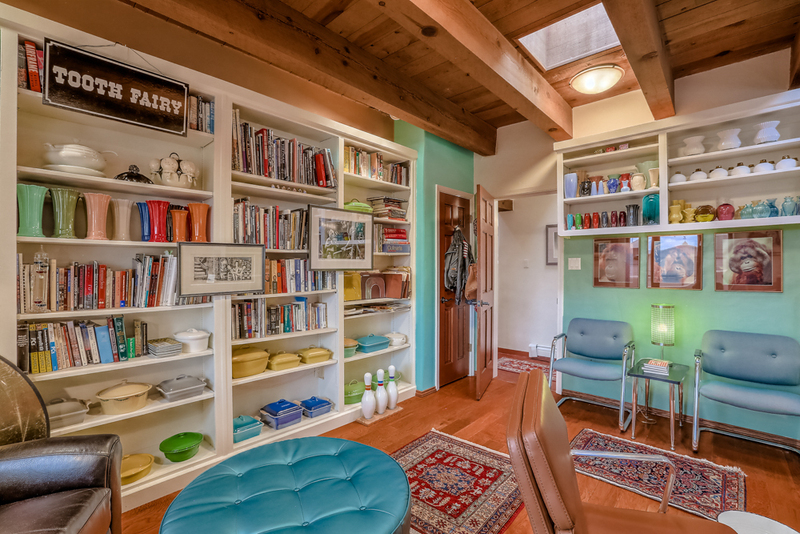 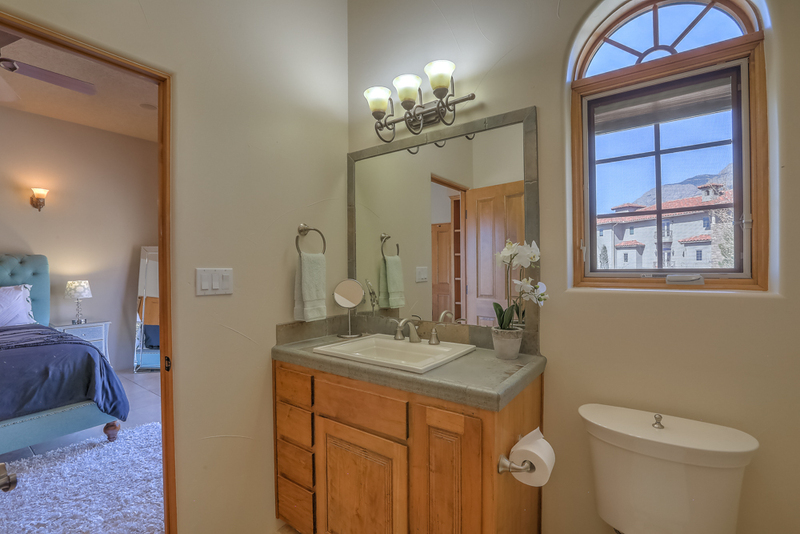 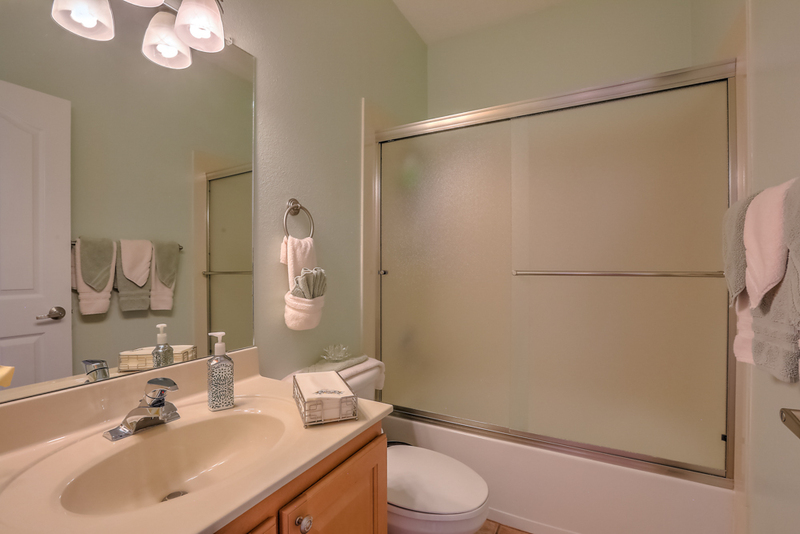 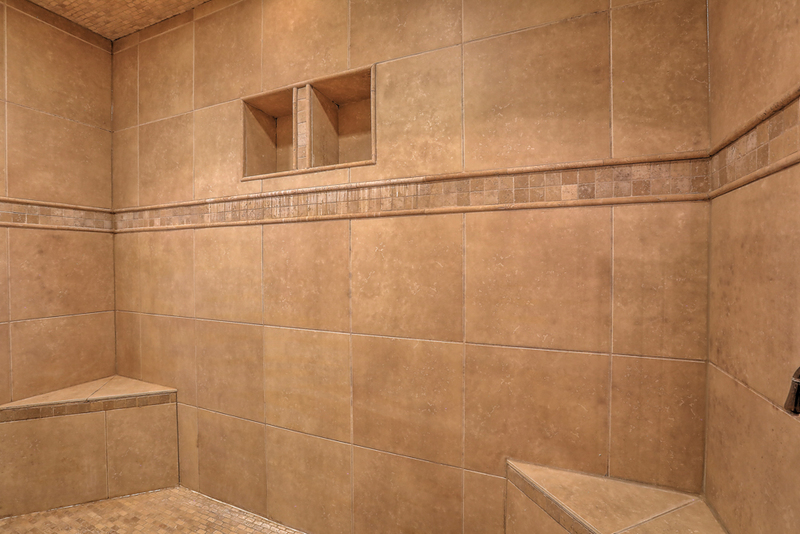 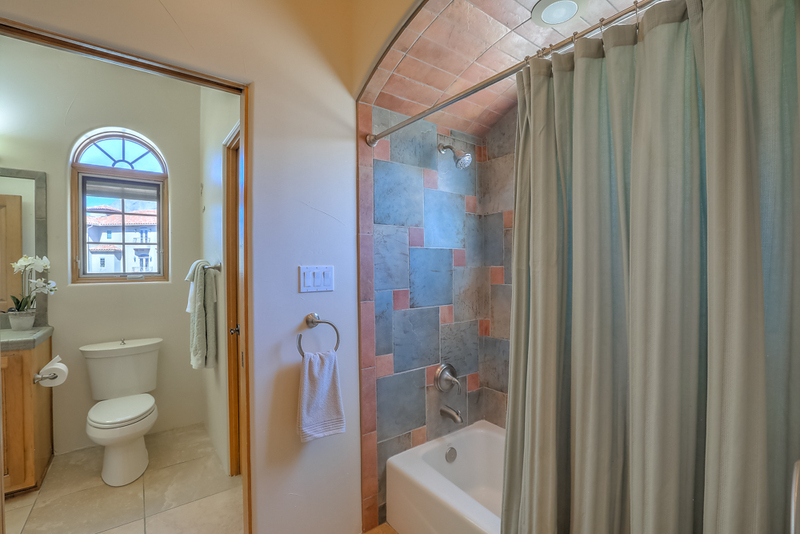 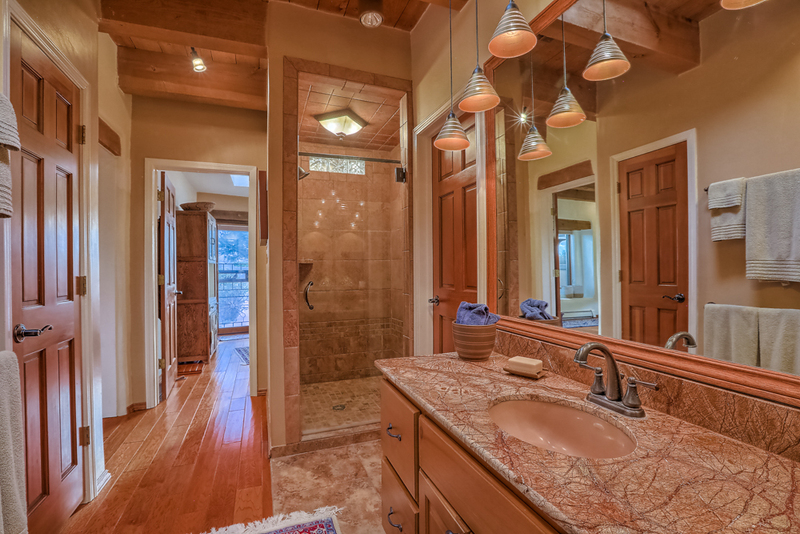 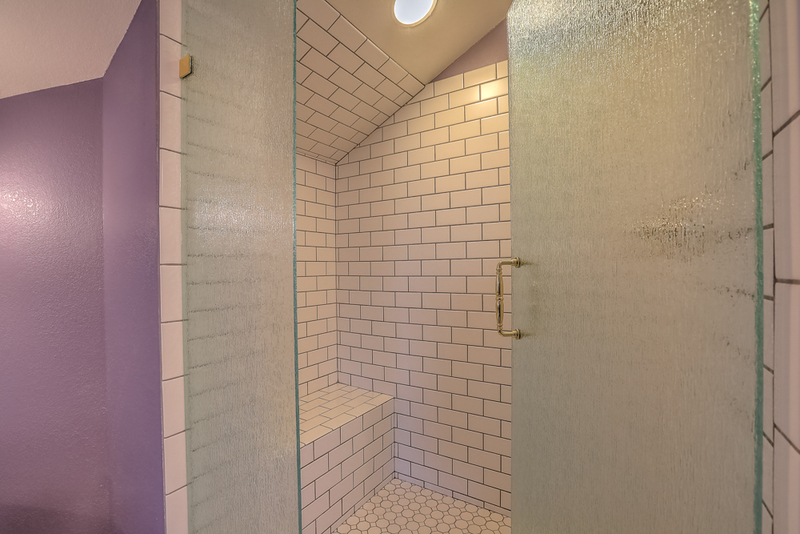 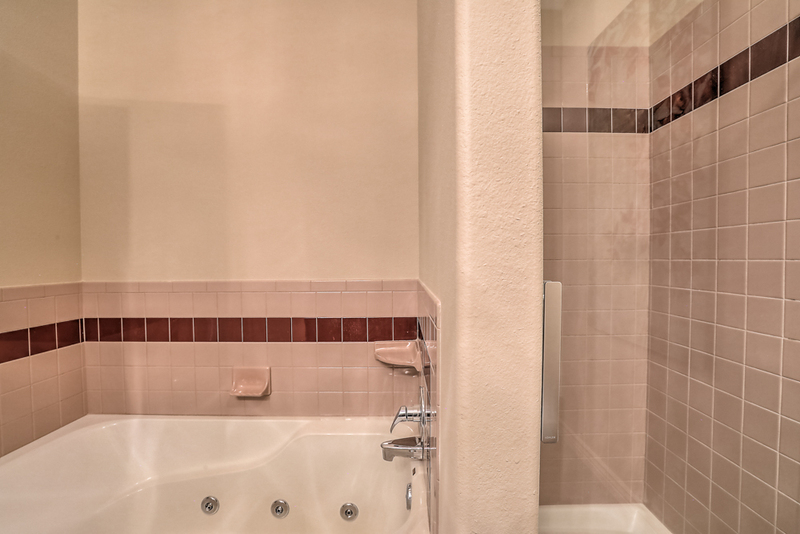 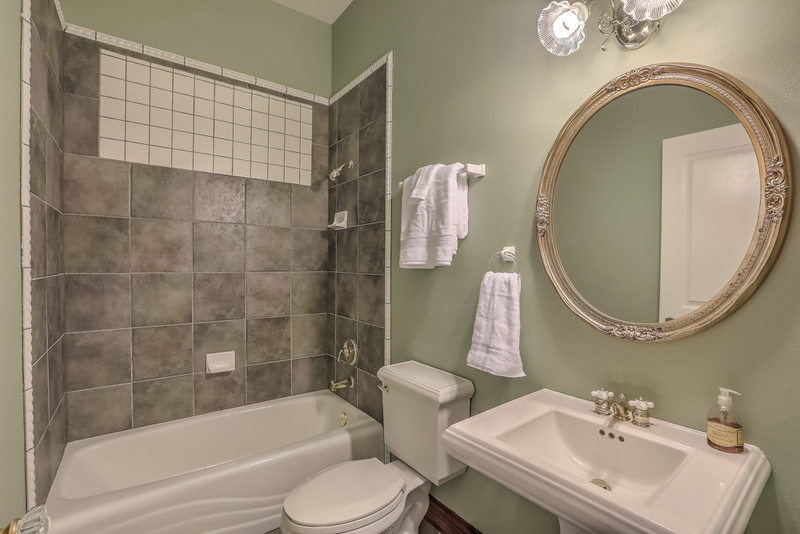 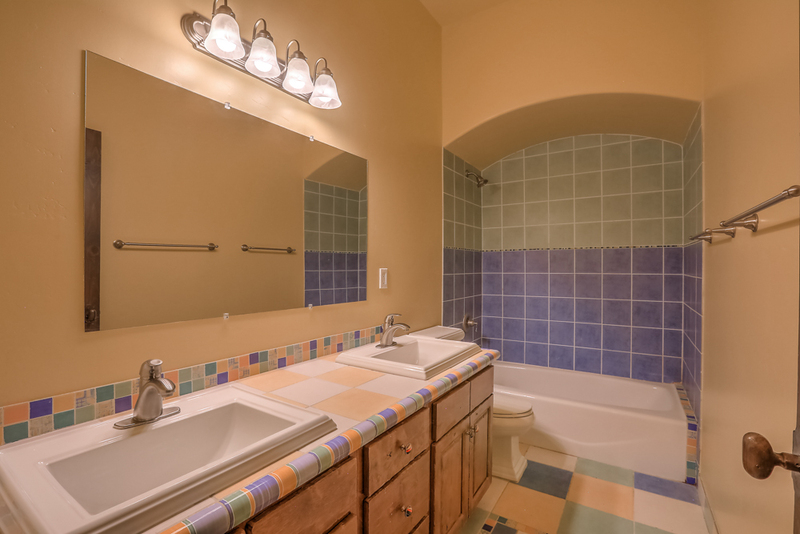 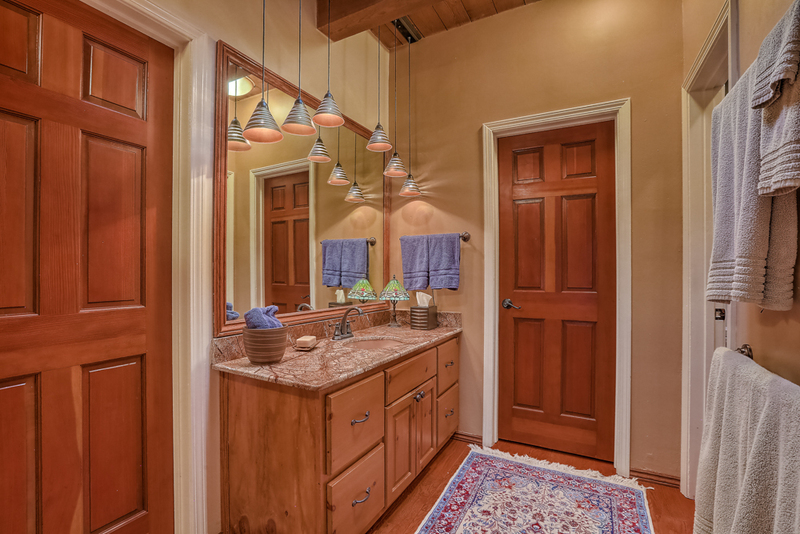 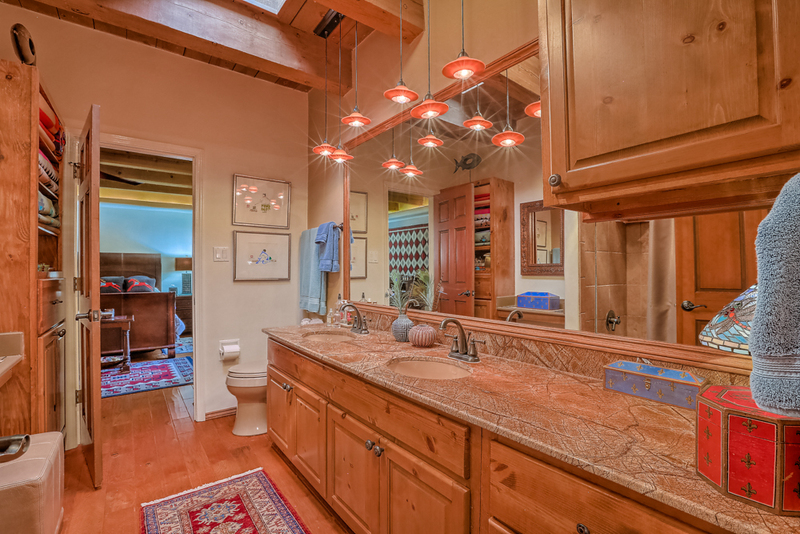 The master bath has double vanities, walk-in glass shower, and a large garden tub for soaking. 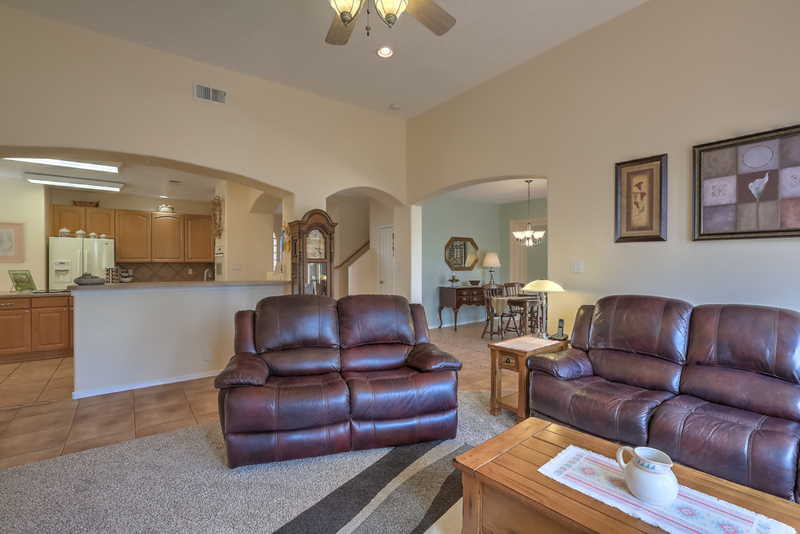 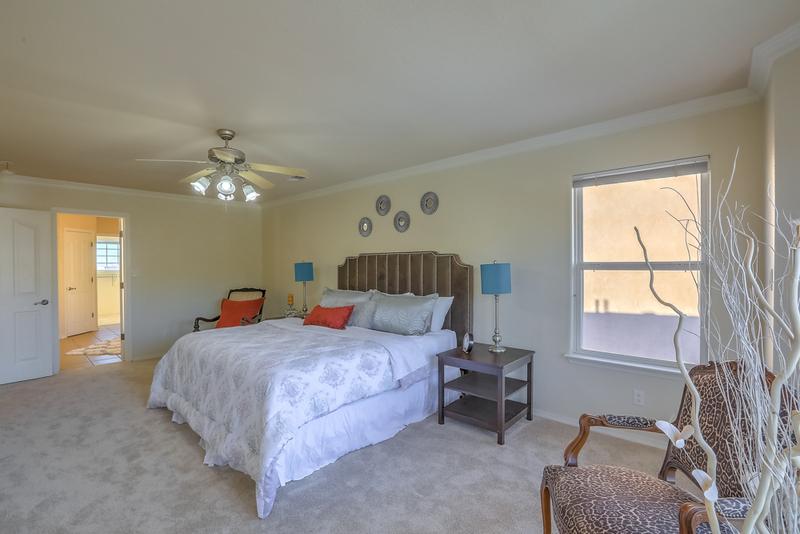 Two extra large bedrooms and second full bathroom also adorn the spacious upstairs living space. 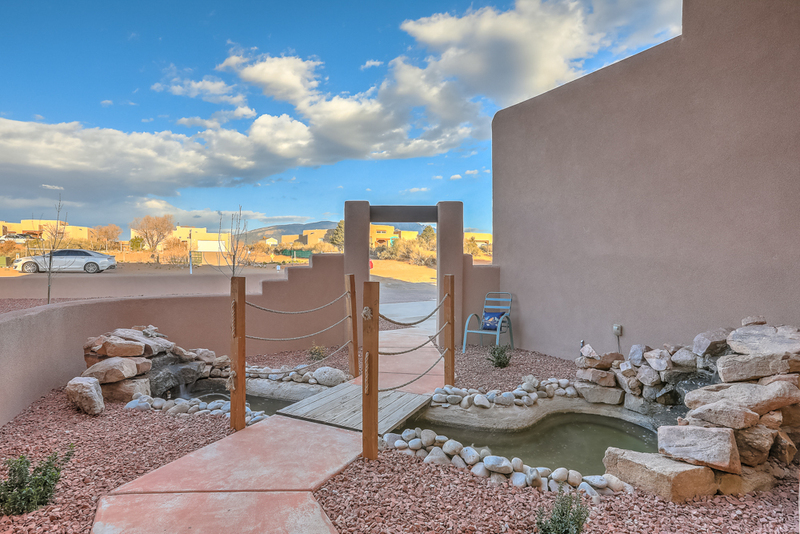 If this wasn't enough you have to come to see the amazing backyard. 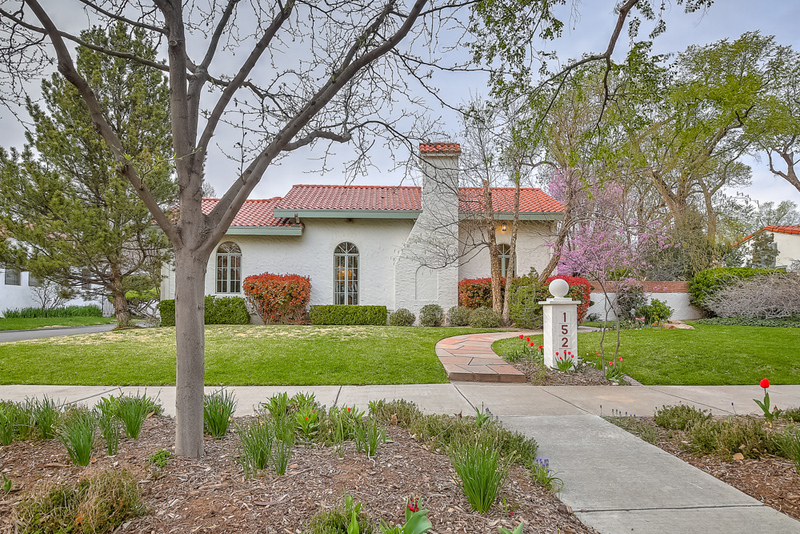 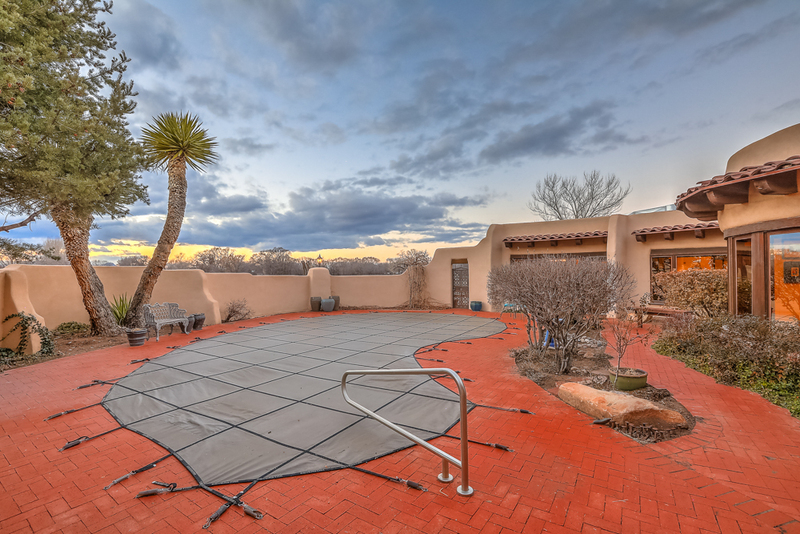 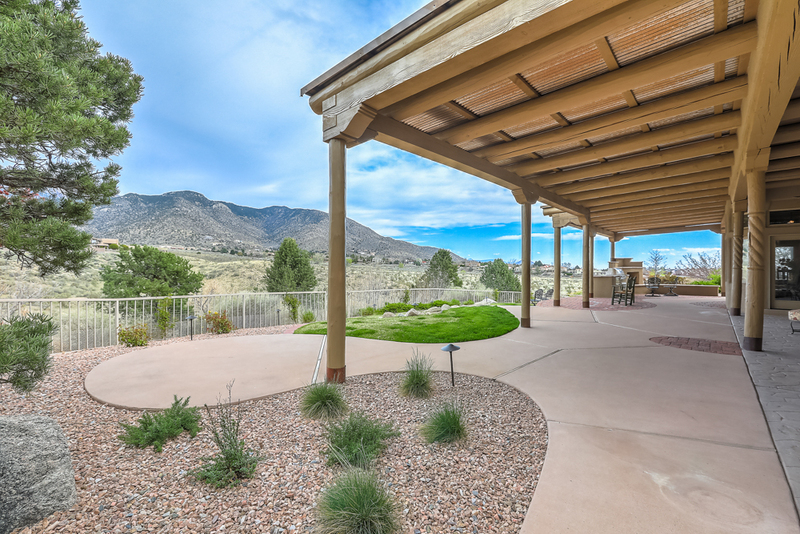 It is fully landscaped and ready for you to enjoy the cool spring mornings with its flagstone print patio/ pathways, covering for shade, grassed area, and beautiful mature flowering shade trees. 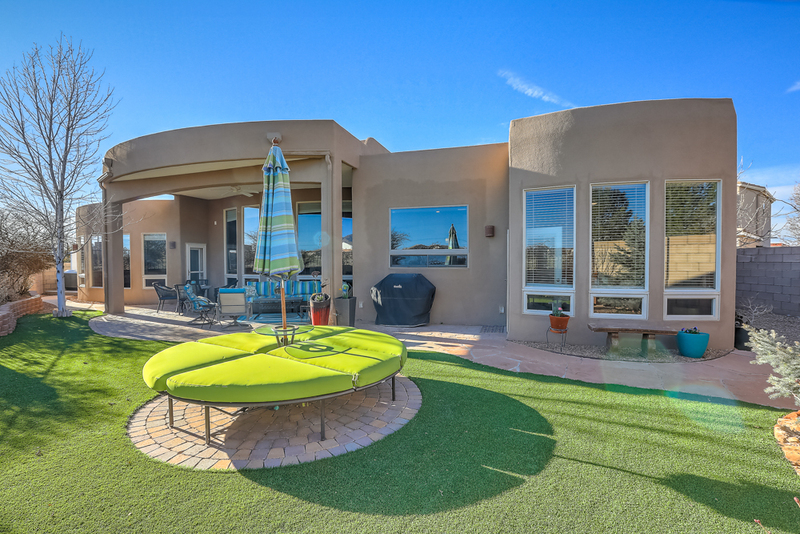 It's the perfect oasis for year-round enjoyment! 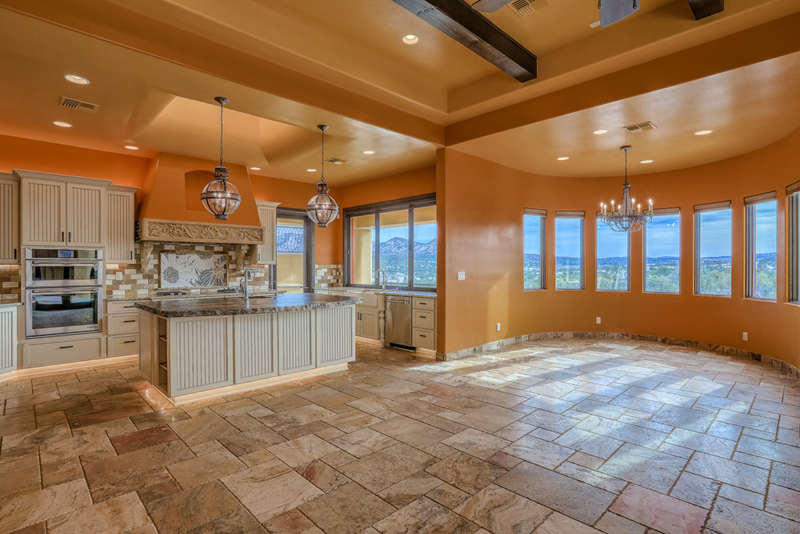 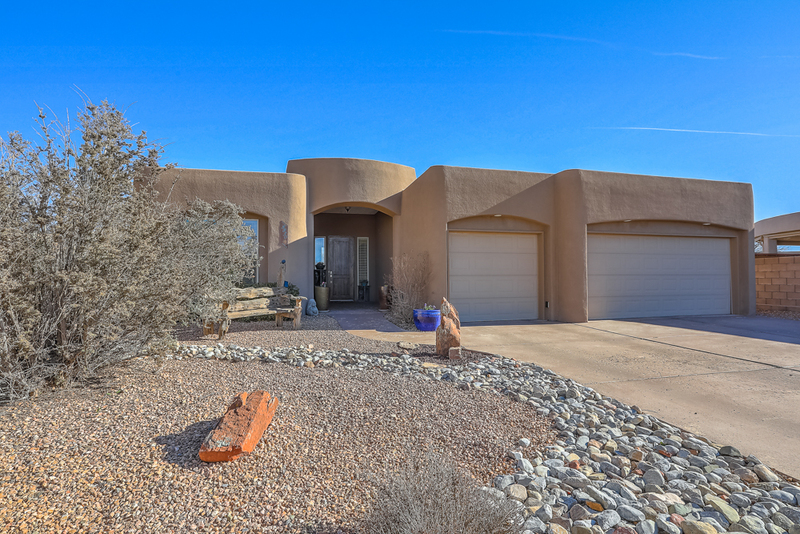 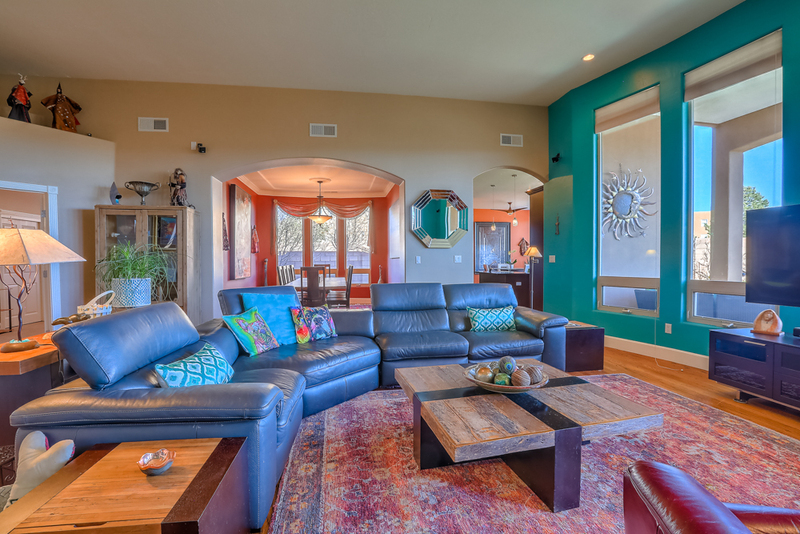 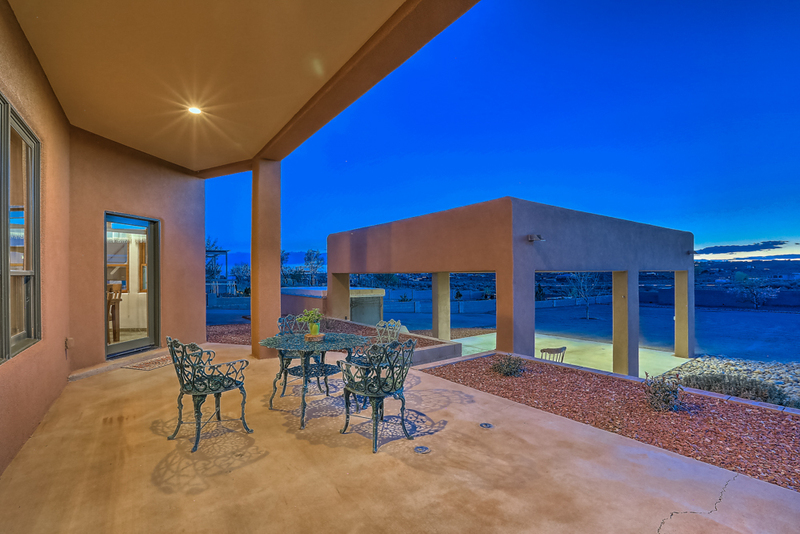 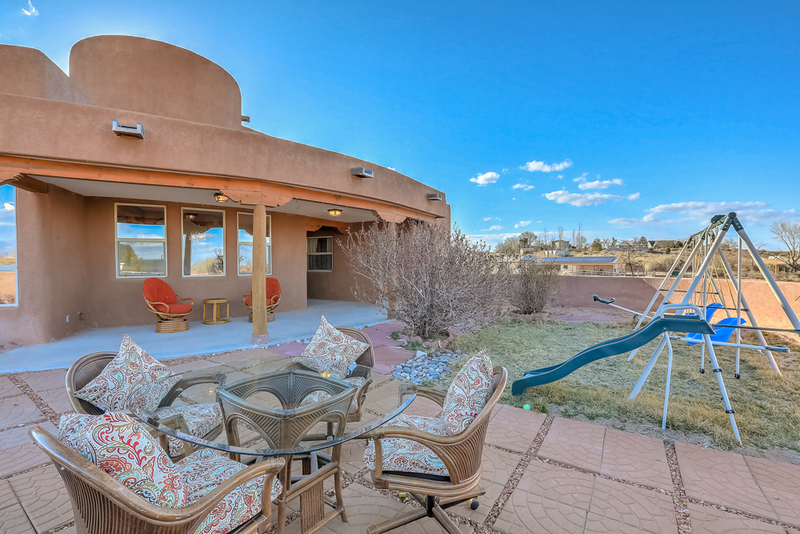 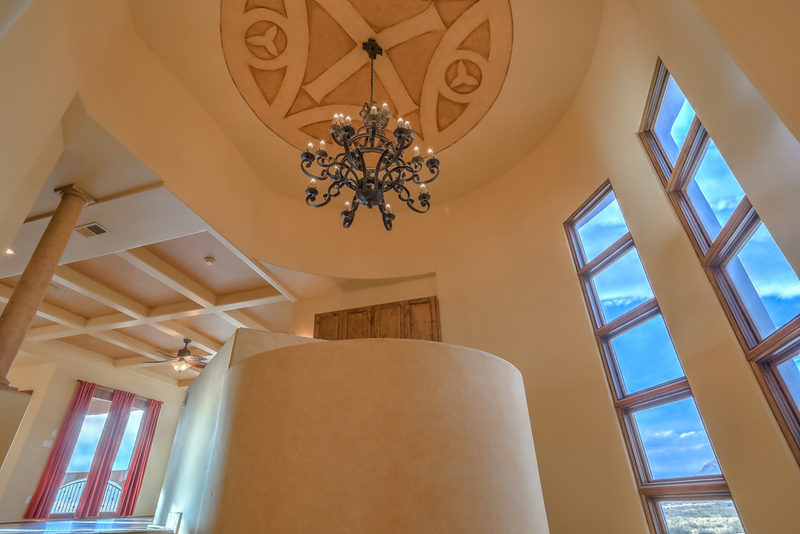 Don't miss out on this amazing home- it won't last long.